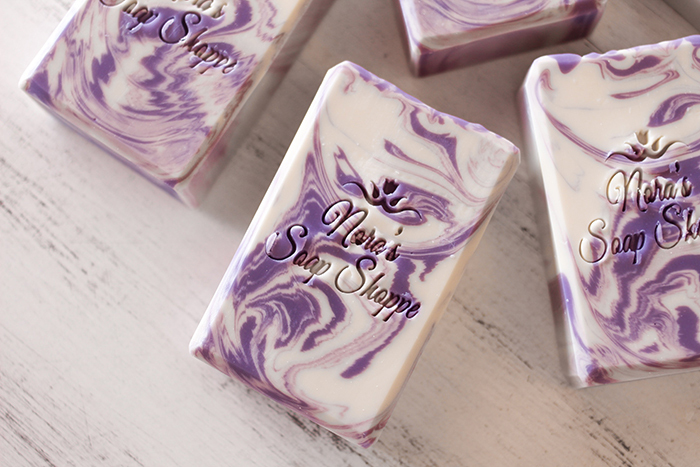 Nora with Nora’s Soap Shoppe is well known in the soapmaking community. Her wispy swirl designs and expert use of color are instantly recognizable when you’re scrolling social media. She’s also known for her positivity and kindness – she makes sure to let people know when she loves their creations. 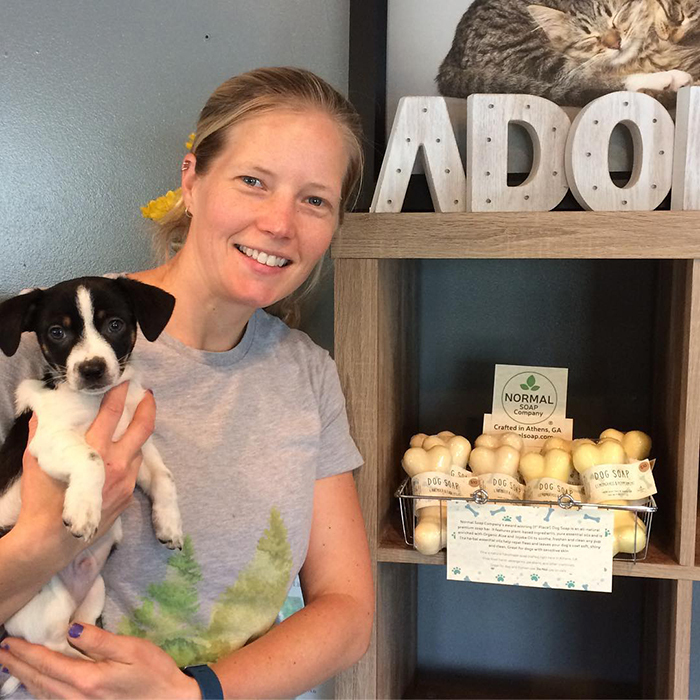 Learn more about how Nora got started, what inspires her, and her soapmaking tips. 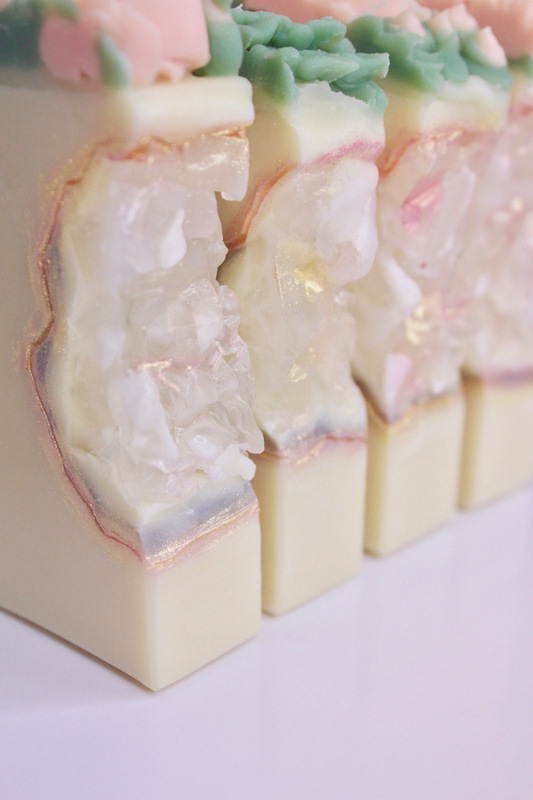 Back in 2010, I started dabbling in melt and pour soaps. 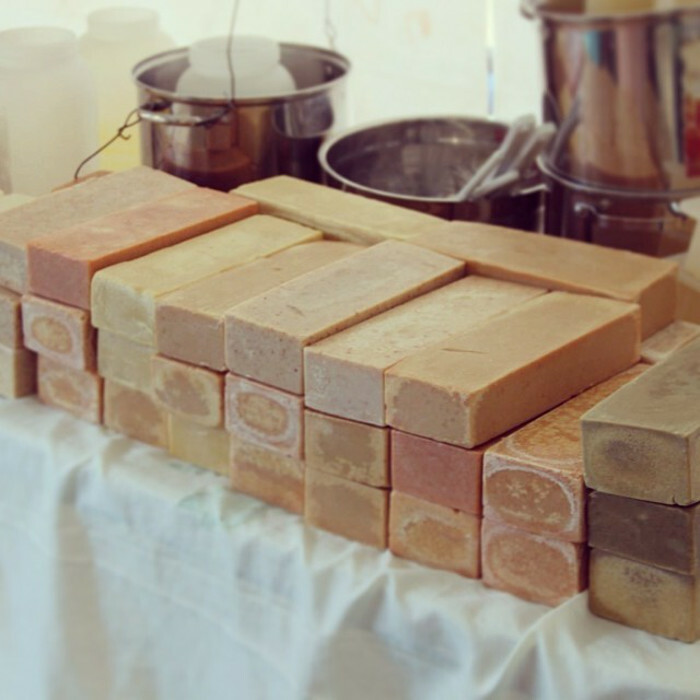 It was such a joy to create handmade soaps for my family knowing what ingredients I put in. By 2012, I transitioned to cold process soapmaking. 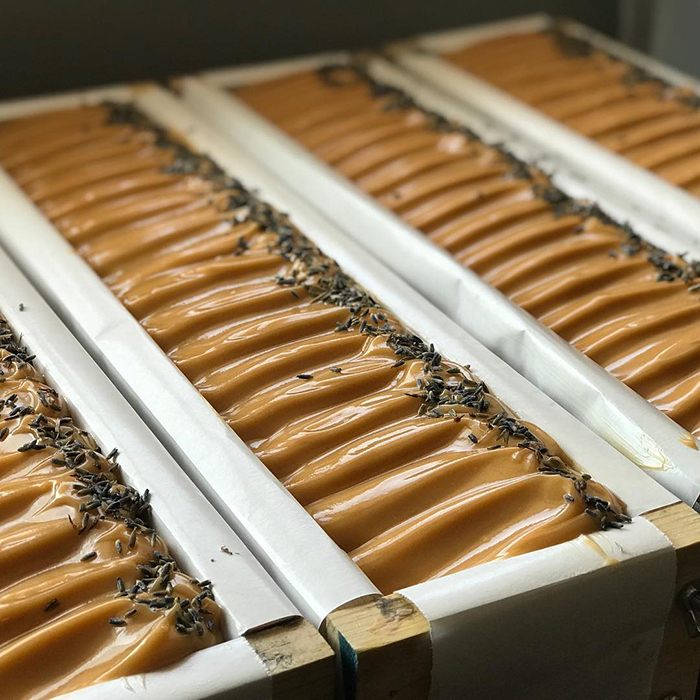 I became so mesmerized by the whole process of cold process soapmaking that I spent many hours and months researching and learning all there is about this technique. I came across the lovely Anne-Marie, the Soap Queen, online. I watched her first four episodes of cold process soapmaking and couldn’t resist purchasing Anne-Marie’s book, Soap Crafting. Having a resource that gave me the foundations of soaping techniques, safety, equipment, methods, SAP values, etc., was truly valuable to my learning journey as a soapmaker. I am a very visual learner, so having the book and tutorial videos accessible to me was very helpful. 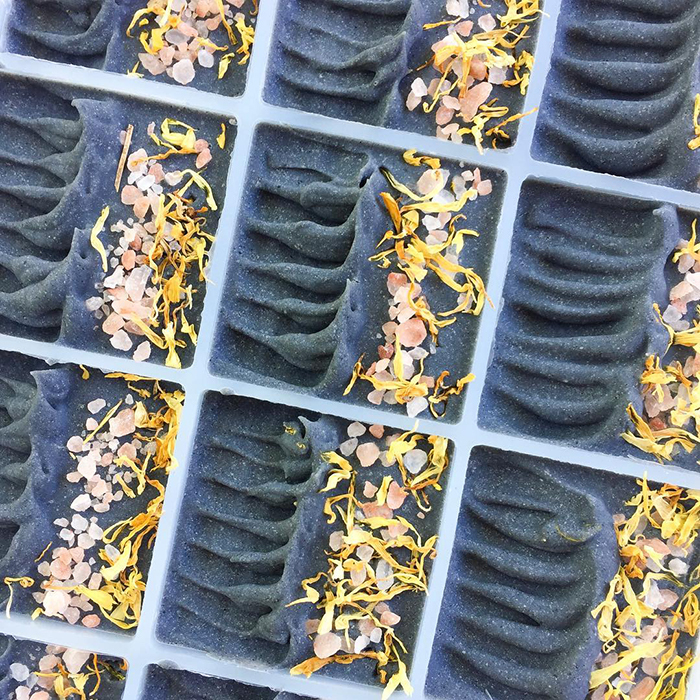 What surprised me the most was the creative side that blossomed in me I really didn’t know I had until I started making soap. I think back to when I was around maybe 10 years old, my mom took me to a cake decorating class. My class project was to make a Barbie cake with a beautiful dress like Cinderella. I can still remember the enjoyment I felt decorating that beautiful cake with pink and white frosting. I think of this time with my mom when I decorate the tops of soaps. With that said, this moment in my life to this day inspires me to create. You just never know what could be the foundation of inspiration for creating. Family, memories, travel, flowers, the weather – I like to always keep things simple and lovely using inspiration around me. 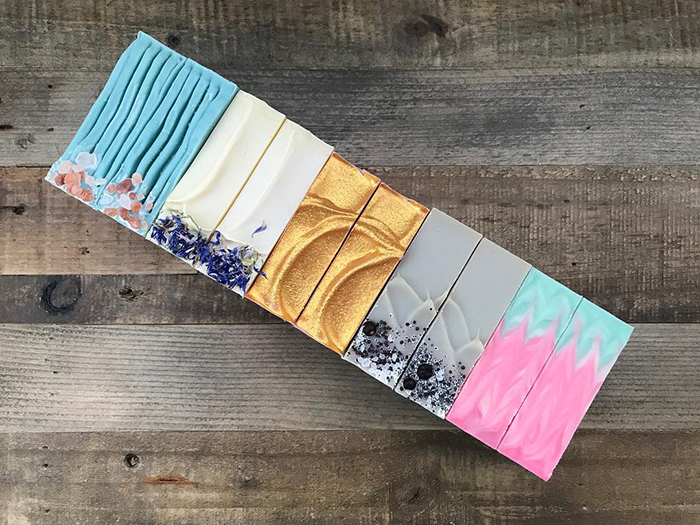 I truly believe this is what makes your soaps that much more special and unique to your brand. 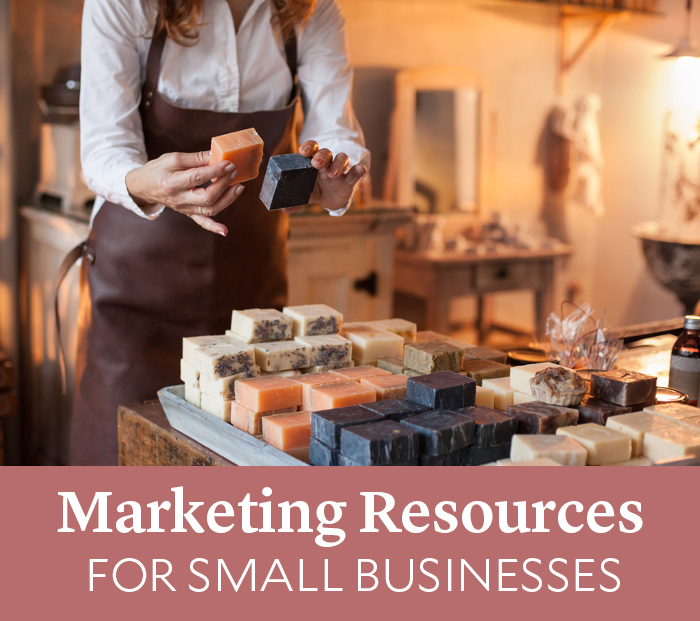 Research is key and learning all you can about handmade businesses in your area and state. Find out as much information as you can and understand it. This is my least favorite part, as at times it can be very confusing. Never be afraid to ask questions. 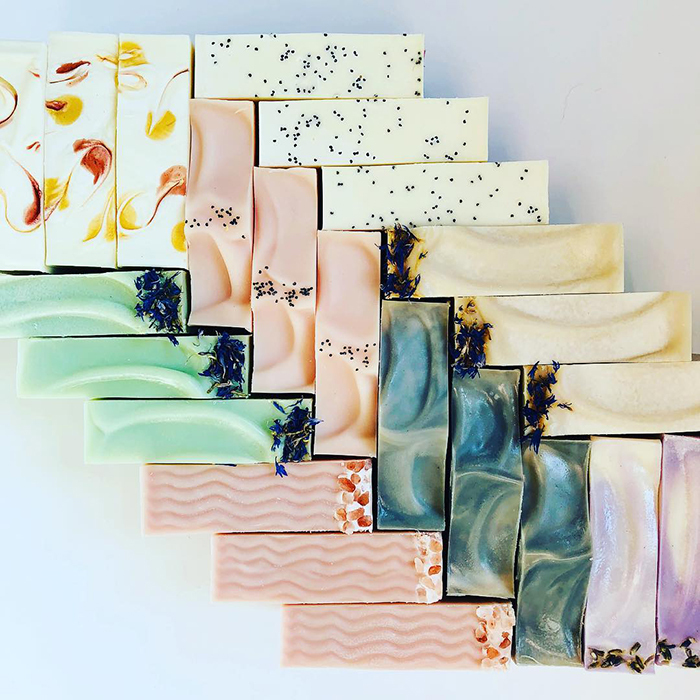 We have a wonderful soapmaking community and there are many gifted and talented makers out there who are willing to give some helpful insight and guide you in the right direction. Spend time creating a good quality product and know your costs, create a good marketing plan so in time you can become profitable in your business. 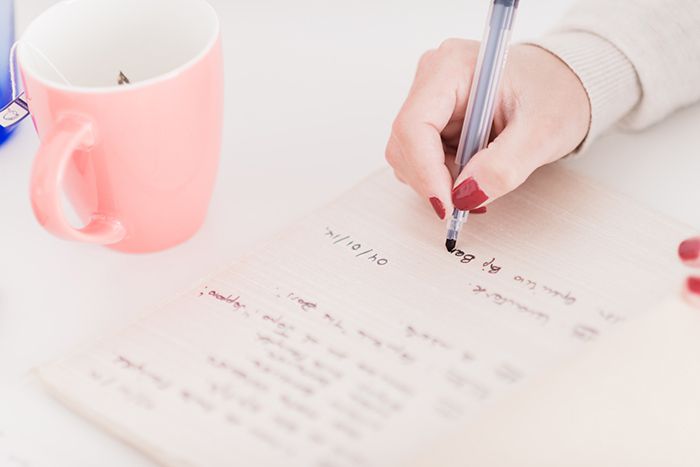 Feeling confident and having the knowledge of your product is very important, too! Choosing a business name can be tricky and needs a lot of thought put in. It seemed that almost every name that I thought of wasn’t available. 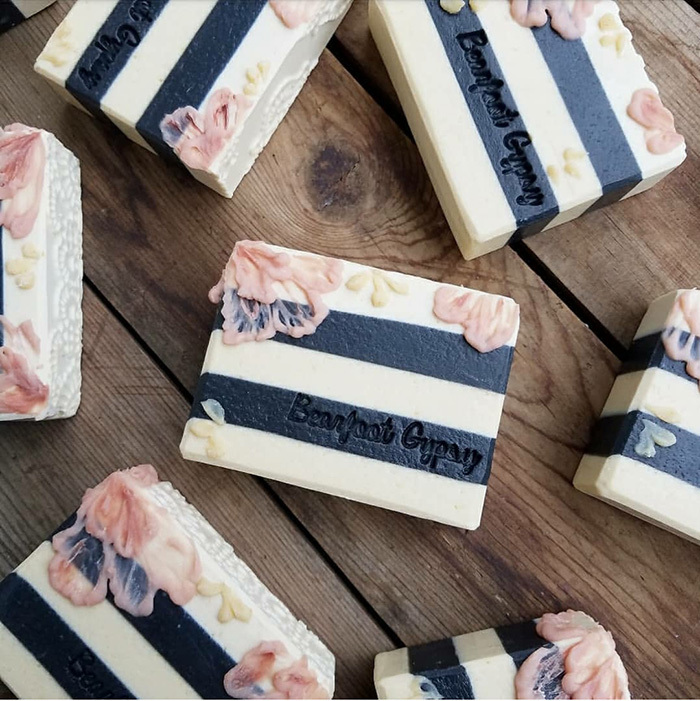 Basically, I thought to myself that I was always told I had a unique name, Nora, and being handmade soap was my main product, I decided on Nora’s Soaps. But the name still needed something else. 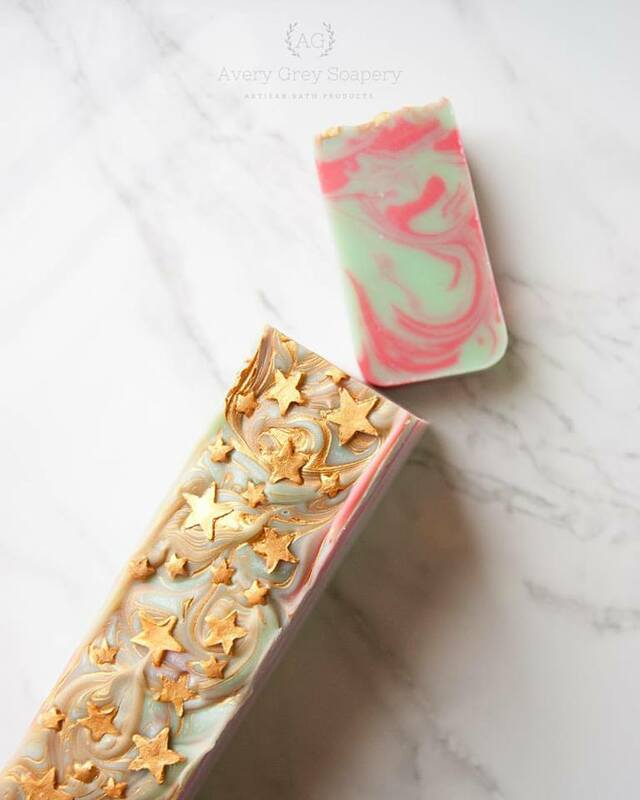 The thought of owning my own soap shop one day is most makers’ dream and goal. So putting that into perspective, I added a little twist of an “e” and there you have it, Nora’s Soap Shoppe. Shoppe has a quaint feel, so it felt just right. 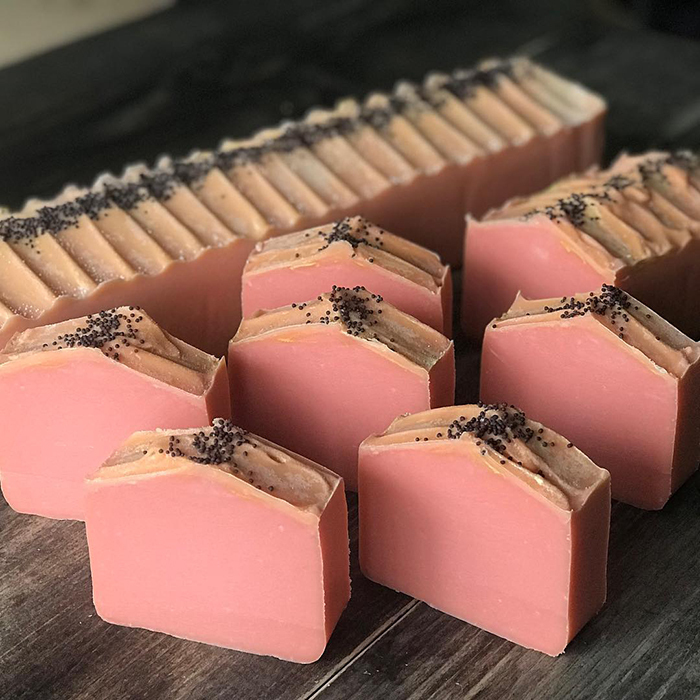 My absolute favorite product to make is cold process soap. 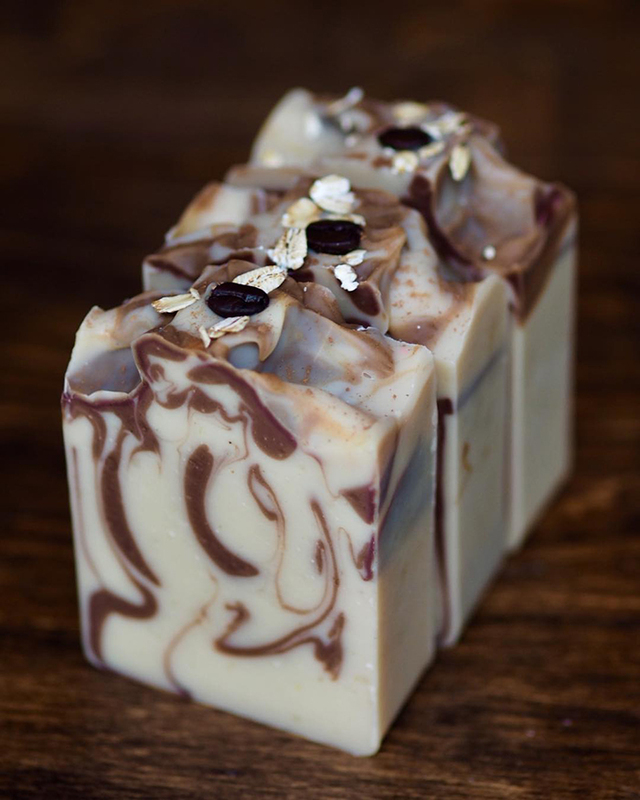 From my very first batch of soap, I knew there was something special about this whole process. There is something just so satisfying about watching the lye and oils mix together into a gorgeous creamy soap batter. 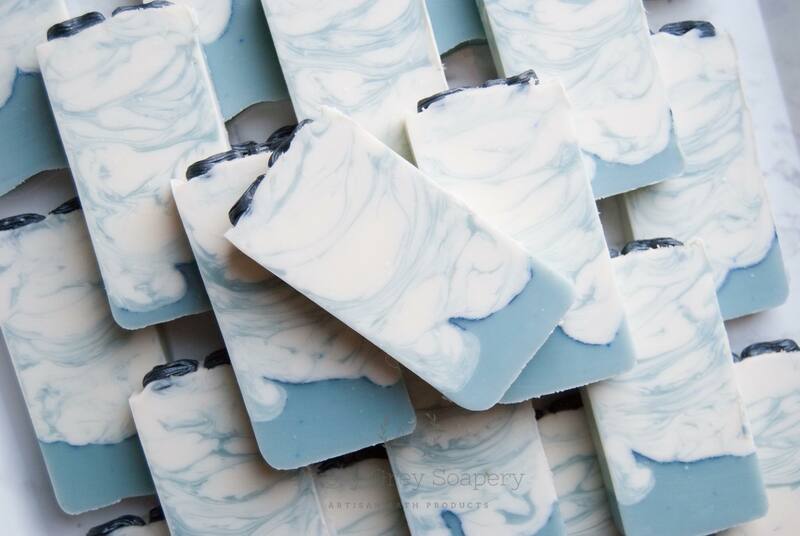 I love creating hanger swirls – they have become my most favorite signature technique and they create a gorgeous wispy swirl in each and every soap bar. 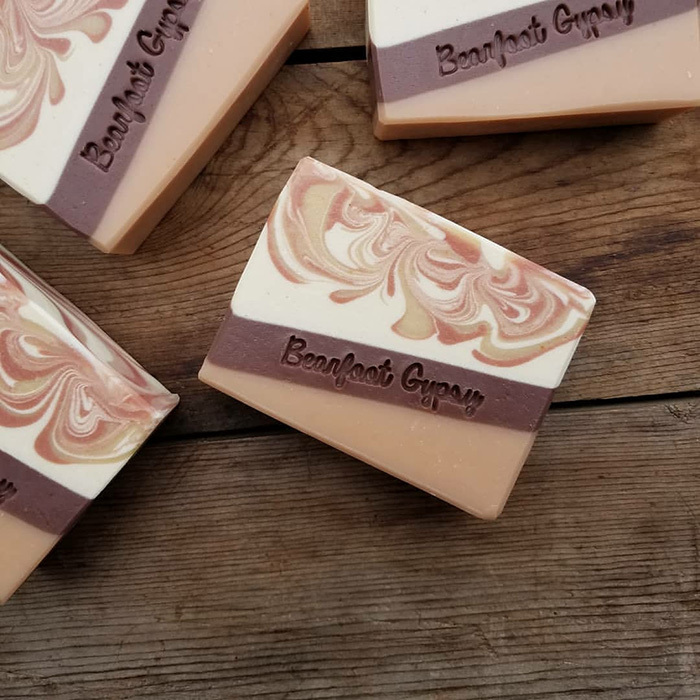 My very first soap supply order was from Bramble Berry, and almost every other since. So this is a very difficult question because I love just about every product they have! What is my favorite? I’ll have to say their colloidal oatmeal. This was one of the first ingredients I ordered and I continue using today. It blends in so smoothly and I also love its benefits. 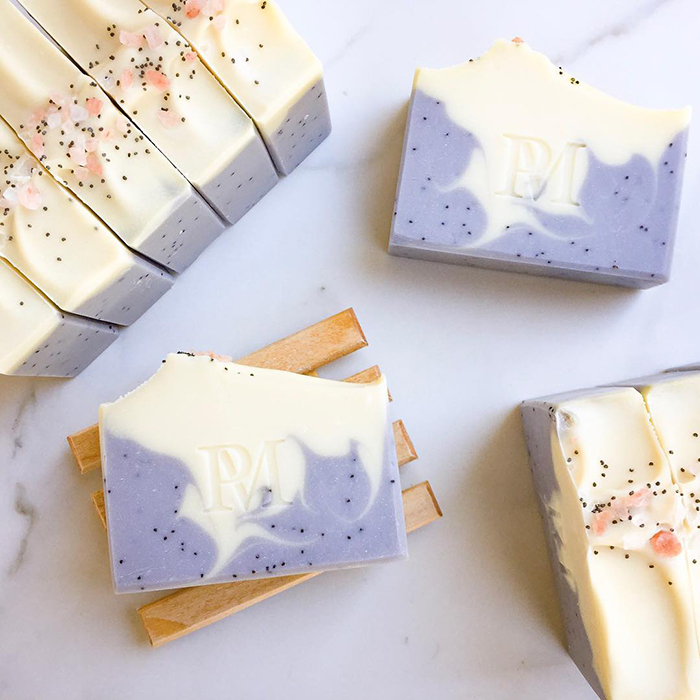 I also must say that even though we were asked for one favorite, I must add in BB’s Lavender 40/42, which is a perfect lavender essential oil and a must-have for my Lovely Lavender Soap. I love everything nostalgia, taking things back to the artisan way of life. A strong focus on family, whom are the most dear to me. Many fond memories of being in the kitchen baking and cooking with my mother and still using family recipes to this day. Reading the classics such as Little House on the Prairie and Anne of Green Gables. 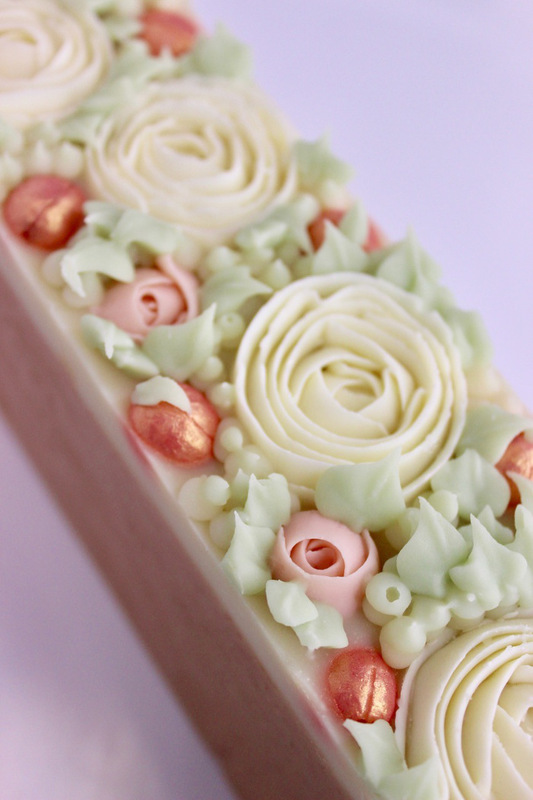 I would even say that this nostalgia that I am drawn to inspired me to make and create soaps. If I am not spending time with my family or soapmaking, I am an avid scrapbooking queen. In this time of everything digital, I do enjoy to print out real photos and create beautiful meaningful scrapbooks for my family to enjoy. My scrapbooking creations are a conversation piece in my home when we are entertaining family and friends and to be able to share those memories is very special to me. I also still love to ski with my family. I can’t keep up as fast as I used to, but I still love being up on the mountain and the feeling of peace and tranquility you experience is just so satisfying. Stay positive! In anything you do there can always be a negative side. One thing I learned in the soapmaking world is just to stay positive and keep moving forward. Don’t let the haters and negativity get you down or affect your creativity. Soapmaking is a happy place for most of us, so keep positive, encouraging, and supportive people around you and keep doing what you love. Have you ever experienced a soapy fail? How did you work through it and what did you learn? 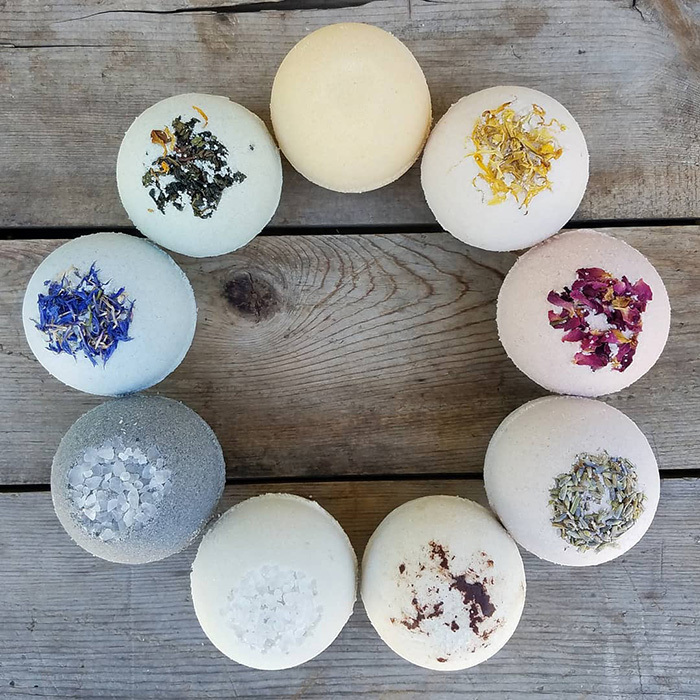 What do you love most about crafting bath and body products? 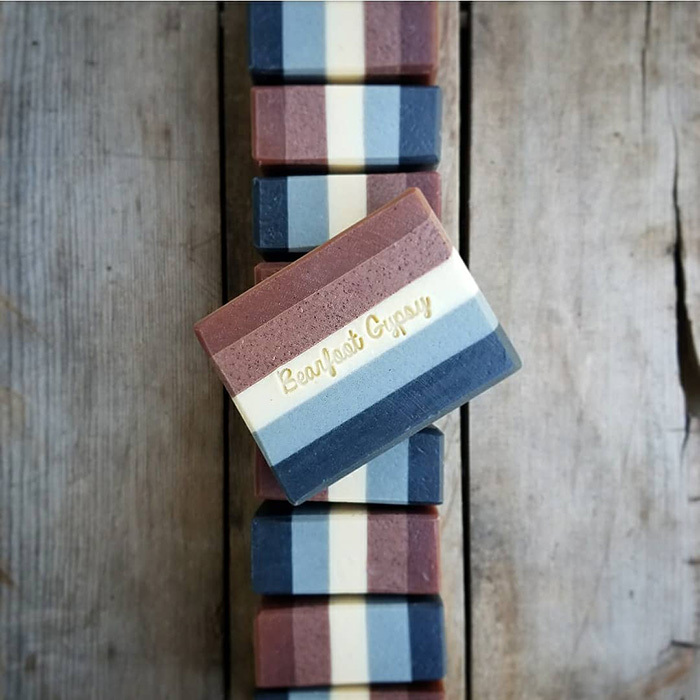 It’s such a joy to be able to go into my soapmaking happy place and be able to make and create something beautiful. 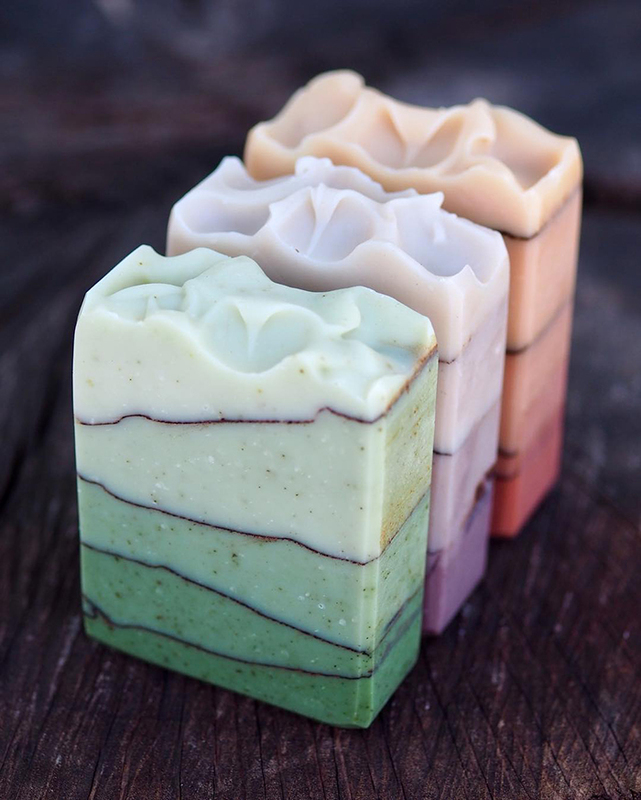 Each maker has such a unique perspective and a beautiful touch to their soaps. I truly believe it’s a way to express ourselves and let our creative streak run wild. 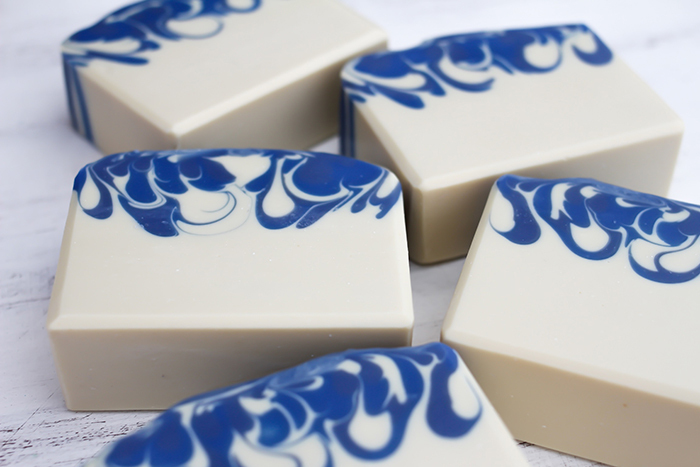 To have the opportunity to share such passion in our handmade products makes me love soapmaking even more! Also, I have never been great with calculations and chemistry, and to now be great at it for soapmaking and creating recipes has become something I most love in my handcrafting journey. A continuously learning journey that keeps you coming back for more. Malina with Ojai Botanika has always been creative. She loves everything from baking to essential oil blending. 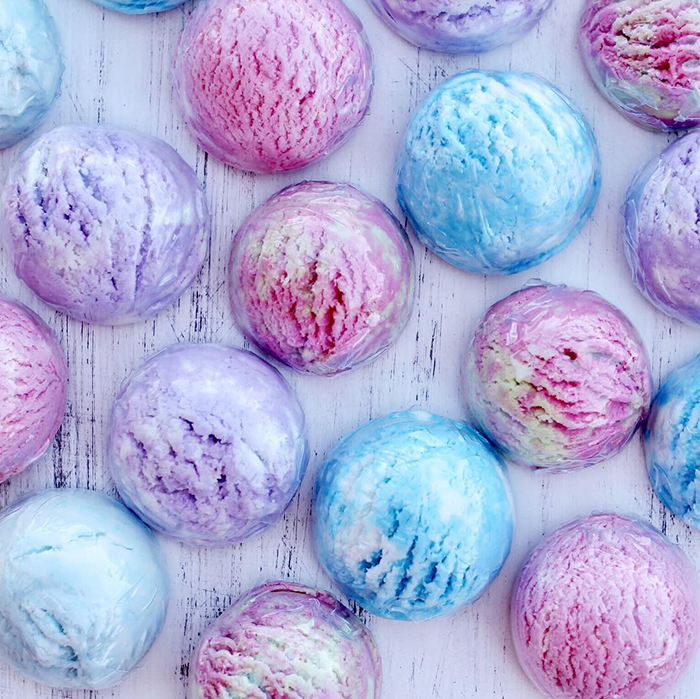 At just 15, she tried soapmaking for the first time and quickly got hooked. 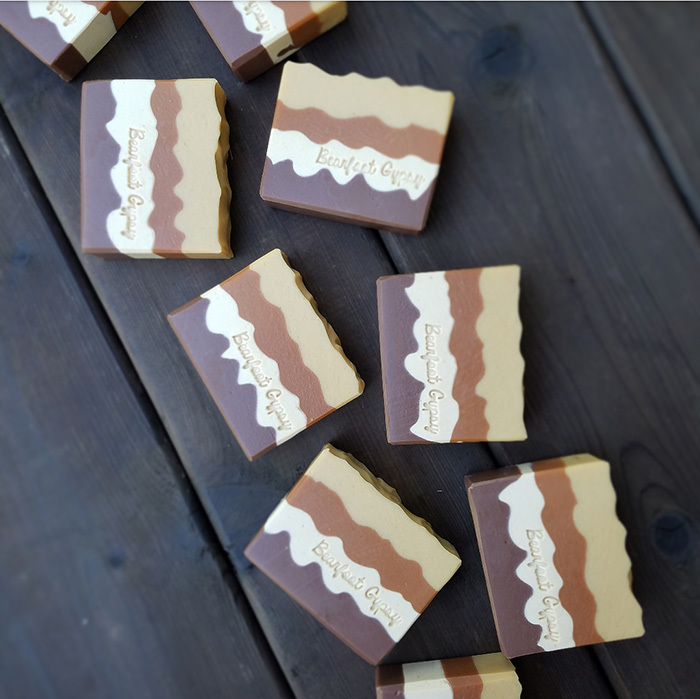 She now sells beautiful bars made with natural colorants and essential oils. 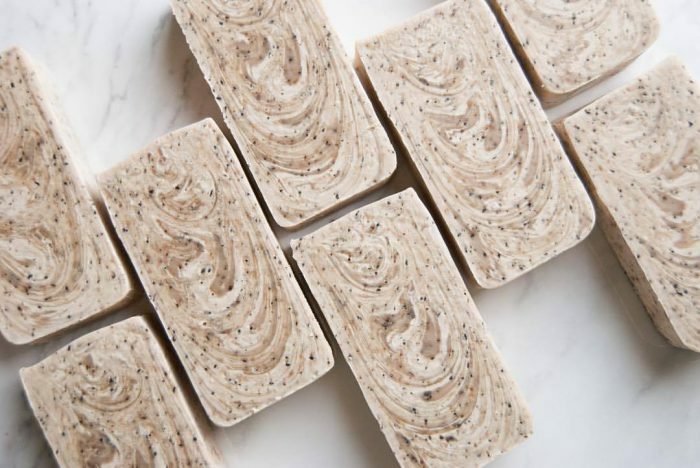 Learn more about how Malina got started, what inspires her, and her soapmaking tips. I’m 21 now, but I started soapmaking almost six years ago, when I was only 15 years old! Actually, years before that, I was already studying herbalism and was interested in natural health and beauty. I was homeschooled for most of my childhood, so I was able to explore my interests and learn unique things at a very young age. I remember my mom was really into essential oils. 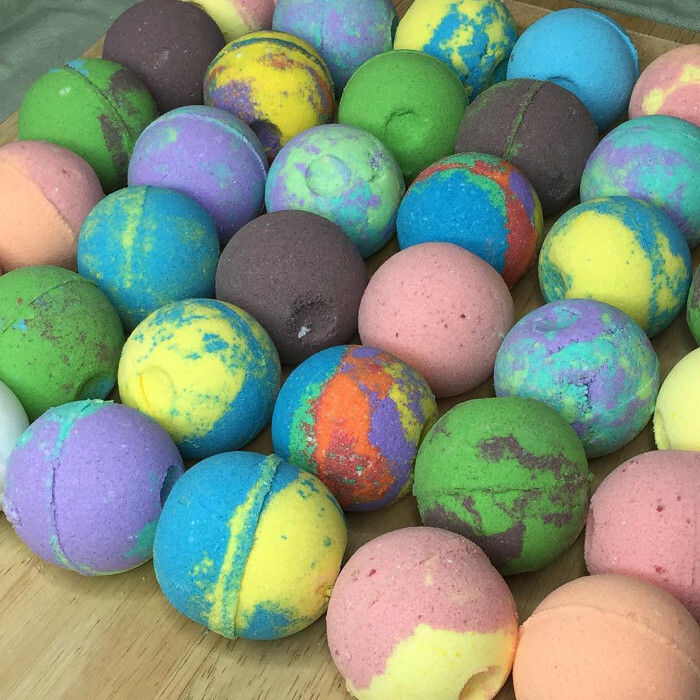 We would have fun blending them and I loved the way they smelled and how I felt when using them. 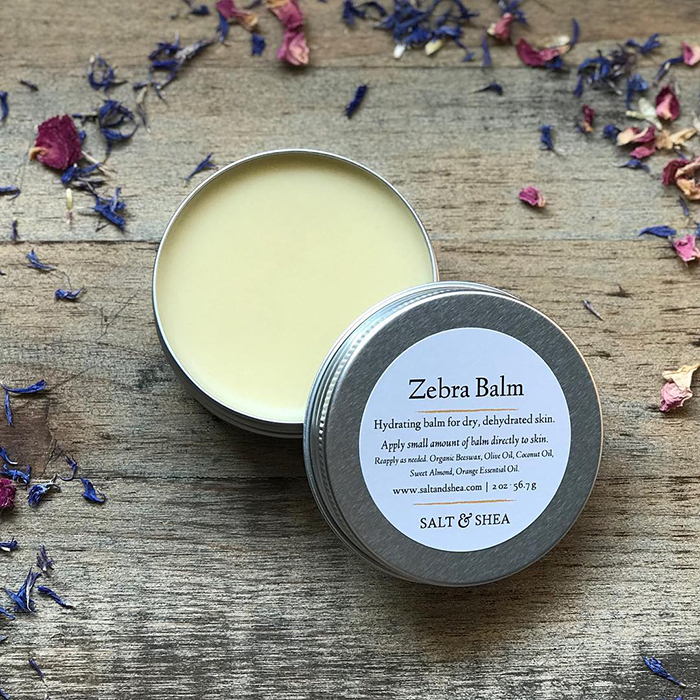 One thing led to another and I started learning how to make herbal balms, lotions and stuff. I remember staying up one night ’til midnight in the kitchen, creating a new body butter recipe. Everyone else was asleep, but there I was with an electric mixer, whipping up copious amounts of shea butter and coconut oil. I’m so blessed that my family was so supportive of my creative endeavors! 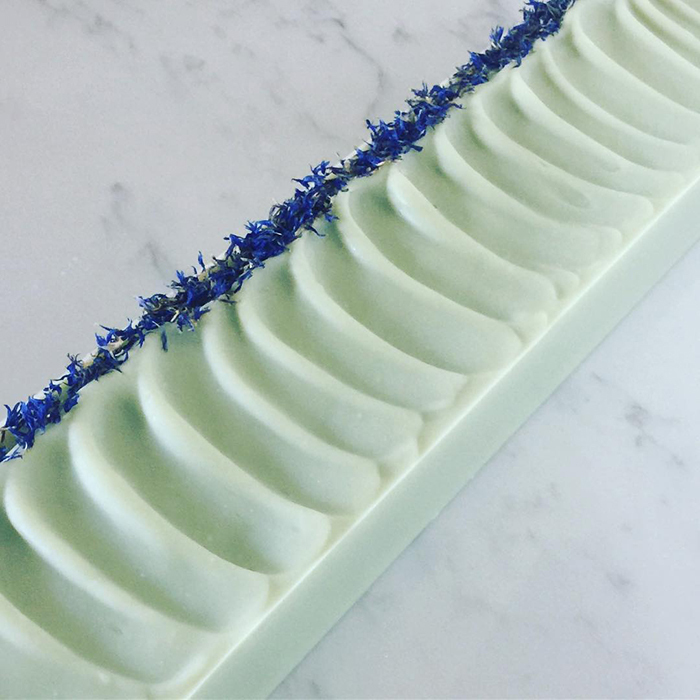 Years later, when I was 15, a friend told me that I’d probably enjoy making soap. She invited me to her studio and gave me my first lesson in soapmaking. I was so fascinated! We did a few more soapmaking lessons and she guided me toward some online resources. I remember spending every free minute reading the Soap Queen blog and watching Soap Queen TV! 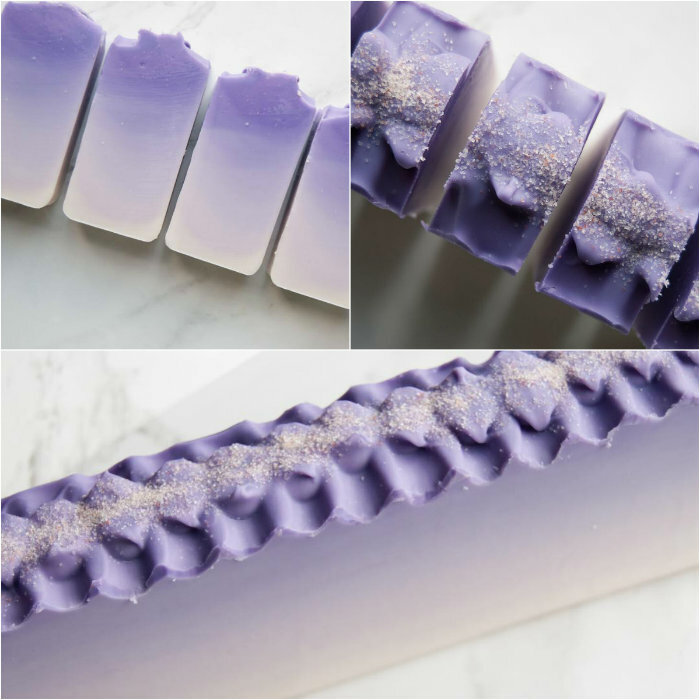 I made my first solo batch of soap using a Bramble Berry Beginner’s Soapmaking Kit. From then on, I was pretty much hooked! 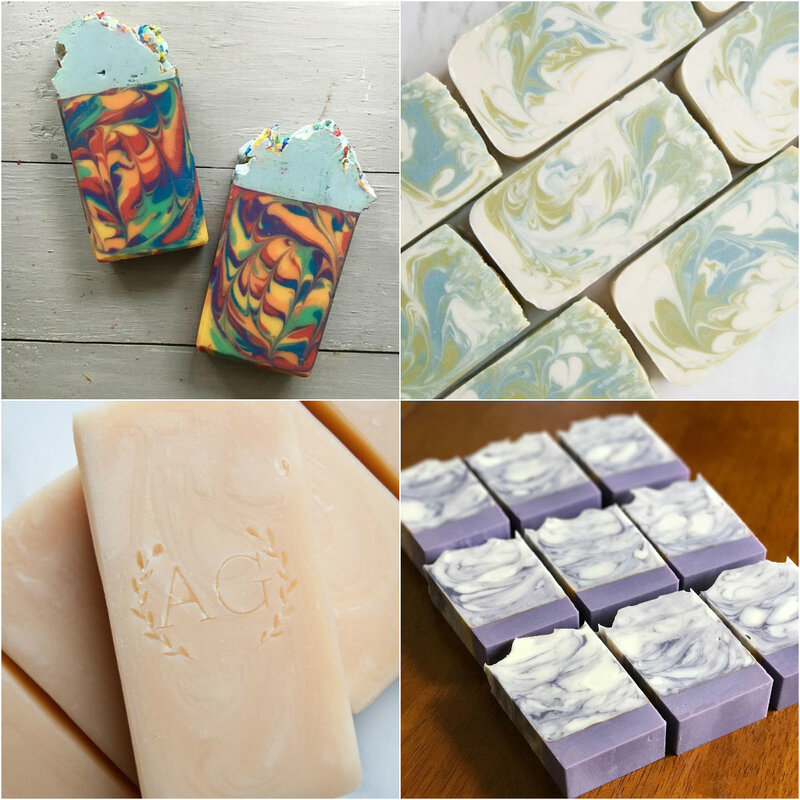 I spent a lot of time testing out recipes and then worked on creating my own unique formulations and designs. 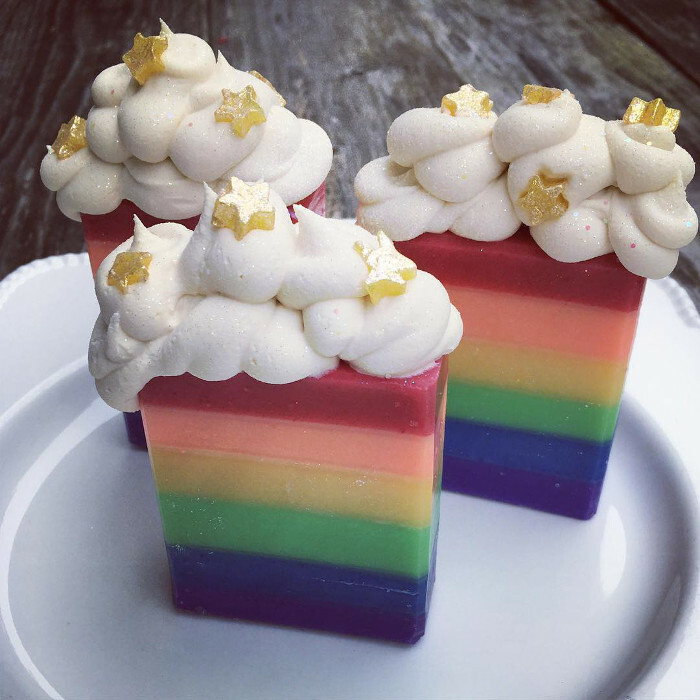 At first, I made soaps just for fun, for friends and family. Everyone kept telling me how much they loved my soaps and how they thought I should start selling them. I started out very small, selling locally via word of mouth. It felt so wonderful to be able to share my creations and bring happiness to others through my soaps. I’m still a very small business, trying to keep up with growing demand. It gets really busy sometimes, but it’s so worth it to be able to pursue my dreams! Follow your passion and trust your intuition! For me, this has been the most important thing to remember all these years. It can be discouraging sometimes when you’re just starting, but always remember what drove you to begin your journey. When you maintain that sense of passion and integrity and stay true to yourself, people will be drawn to you and your products. Surround yourself with supportive people! I’ve had such incredible support from friends and family. Take time to create recipes that are uniquely yours, and be sure to test them thoroughly. Once you have a product that you’ve tested and are confident in selling, take the necessary steps to become a real business. It may not be the most fun, but taking care of business matters like insurance, business license, etc., ahead of time will give you peace of mind and allow you to focus on what you’re really passionate about! Definitely cold process soap! There’s something about the magical process of oils and lye mixing together that really appeals to the alchemist in me. I also love the freedom to create beautiful designs and scents. 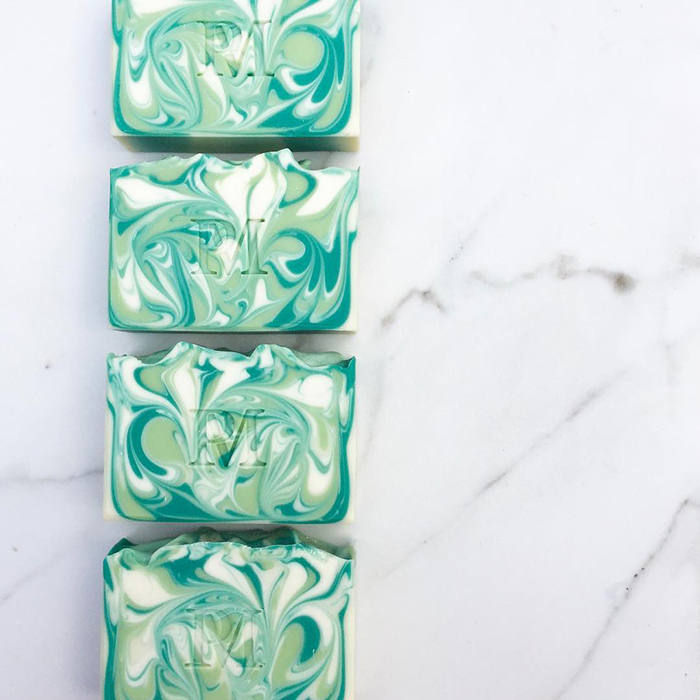 I especially enjoy swirling soap; no two bars have the same design! I’m the type of person who is constantly in creative mode, so I find inspiration in everything. I’m especially inspired by nature! 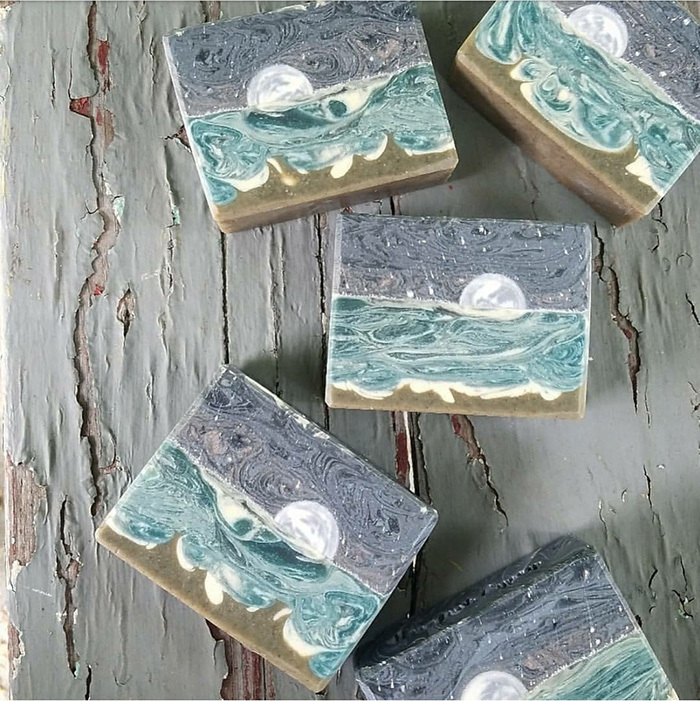 I’ve created lots of soaps with locally-grown ingredients and designs inspired by our local mountains, trails, meadows, flowers, night skies, herbs, and trees. Ojai (pronounced like “Oh, hi!”) is the name of the little town where I was born and raised. It’s tucked away in a valley, not too far from Los Angeles, CA. It’s such a special place; the energy here is so beautiful and unique. It’s known for being a very artsy town and is home to lots of super-talented people. Since Ojai has been such a big part of my life and inspiration for my brand, I wanted to honor it in my business name. Ojai is also the local Chumash Indian word for moon! I’m really drawn to the moon, so it seemed like the perfect fit. The name “Ojai Botanika” pays homage to my beautiful home and the natural botanicals that I use in my creations. 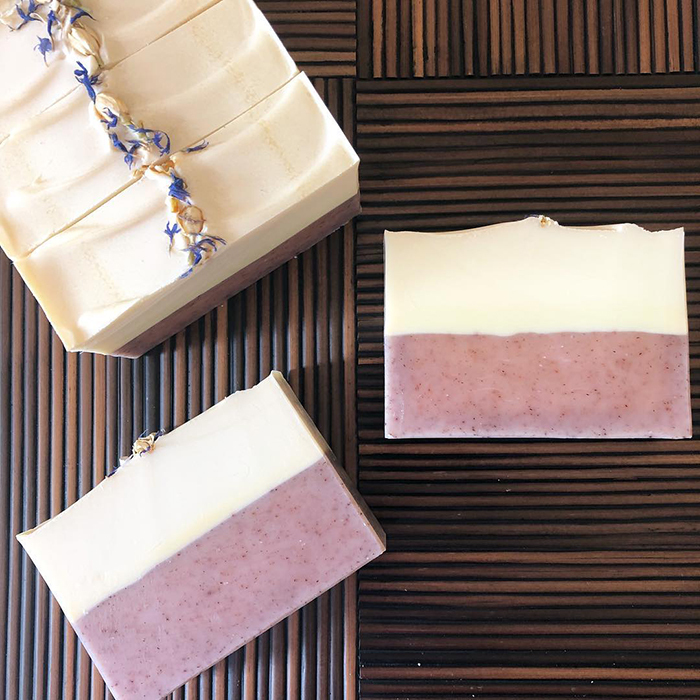 I have been using Bramble Berry products since my friend first taught me about soapmaking! I remember when she gave me a Bramble Berry gift card for my birthday; I was so excited! I got to try all kinds of wonderful new ingredients. Some of my favorite products are the natural clays. 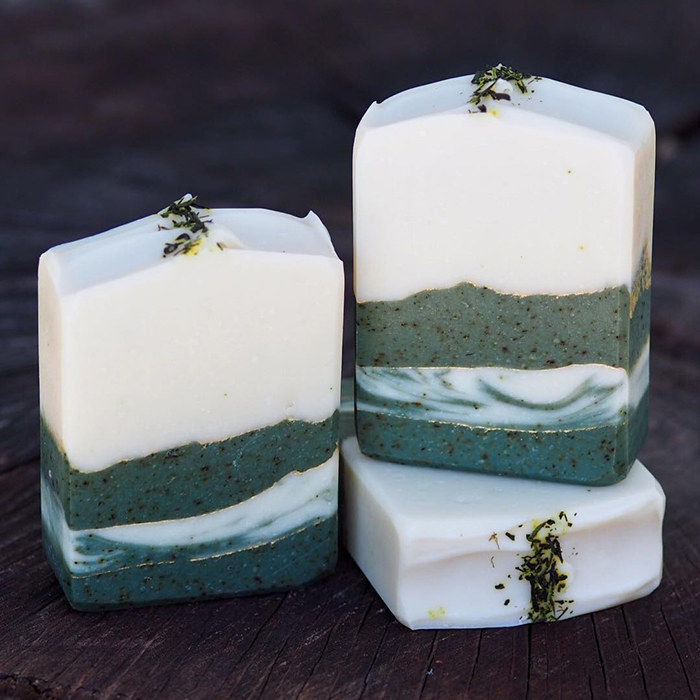 They add a lovely slip and beautiful colors to my natural soaps. Rose clay is my absolute favorite! 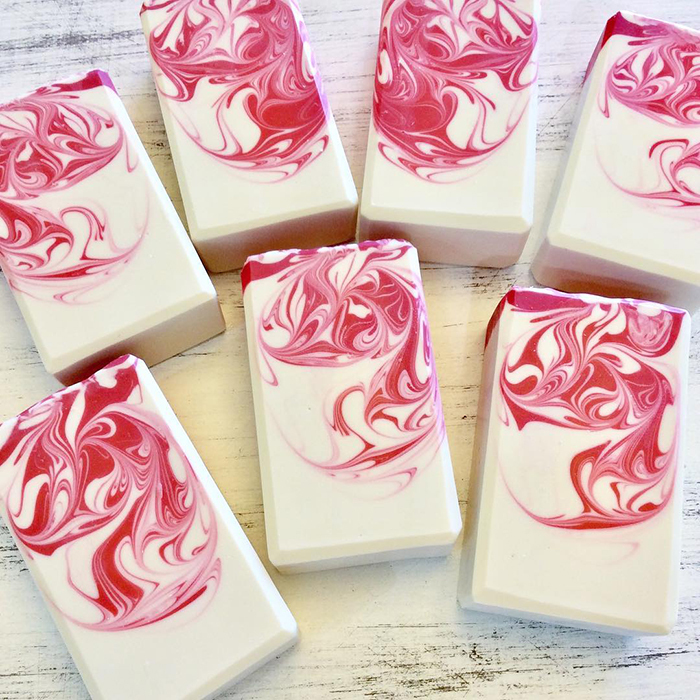 I use it in one of my most popular soaps, “Ojai Rose,” to create the beautiful pink swirls. I’m also a huge fan of the indigo powder. 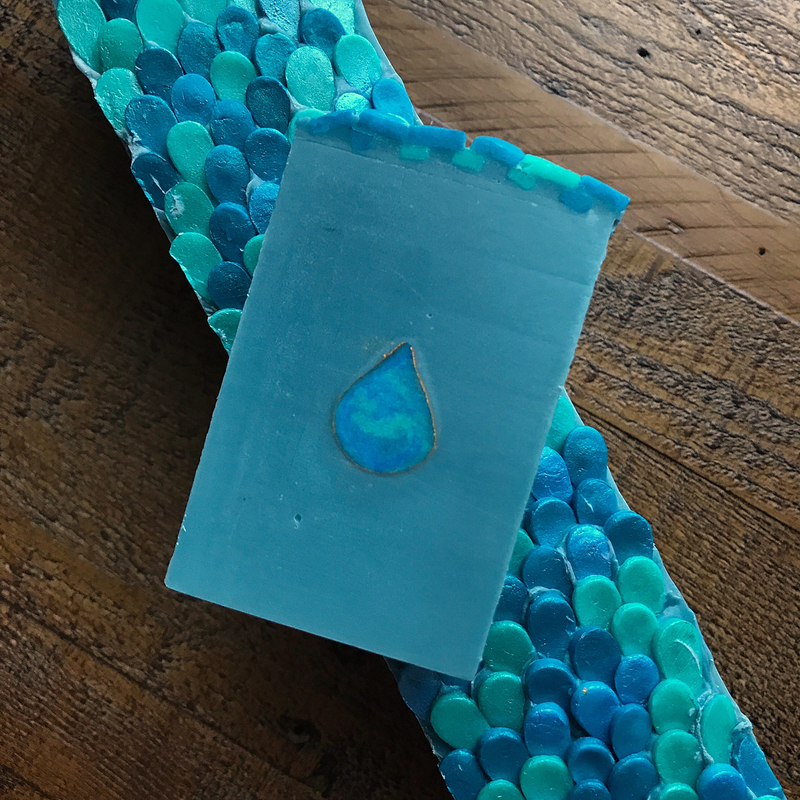 It gives such a lovely, natural denim-blue tone in soap. I’m actually a very introverted person. I was hesitant when I first started my business because I thought I would have to be “on” all the time. But, being able to share my passion with such a supportive community really helped me to break out of my shell and become more comfortable and confident. Reading is one of my absolute favorite things to do. I would happily read for the rest of my life. I also love listening to music! I always have music playing while I work in my soap studio! It really helps keep me upbeat and productive. I’m also an avid baker! I love making super-yummy, healthy baked goods. One of my biggest passions, besides soapmaking, is makeup. When I was little, I would love sitting next to my grandma, watching her apply her makeup. It was so fascinating to me! Once I started, I never got tired of the process of applying makeup, and I love wearing it. It feels like art to me. Fun fact: before I fell in love with soapmaking, I was seriously considering becoming a professional makeup artist. I guess it makes sense that I would end up creating products in the beauty industry! Soaping at room temperature! Ever since I learned about that, it has really changed my soaping game. I used to have such a hard time with my soaps getting too hot and accelerating, since I’m not the most patient person. Now, I just prep my oils and lye one day and the next day I’m able to make loads of soap pretty easily. 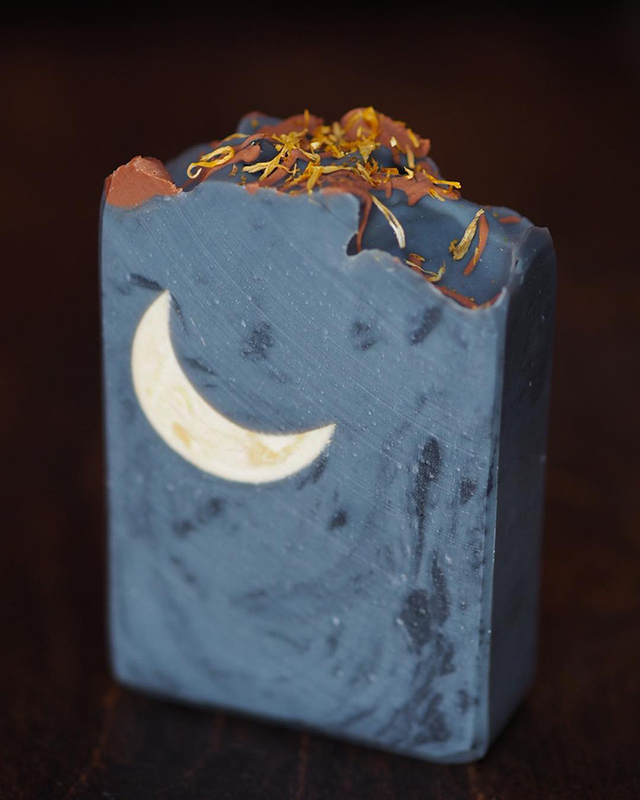 I would probably choose a bar of my crescent moon soap! 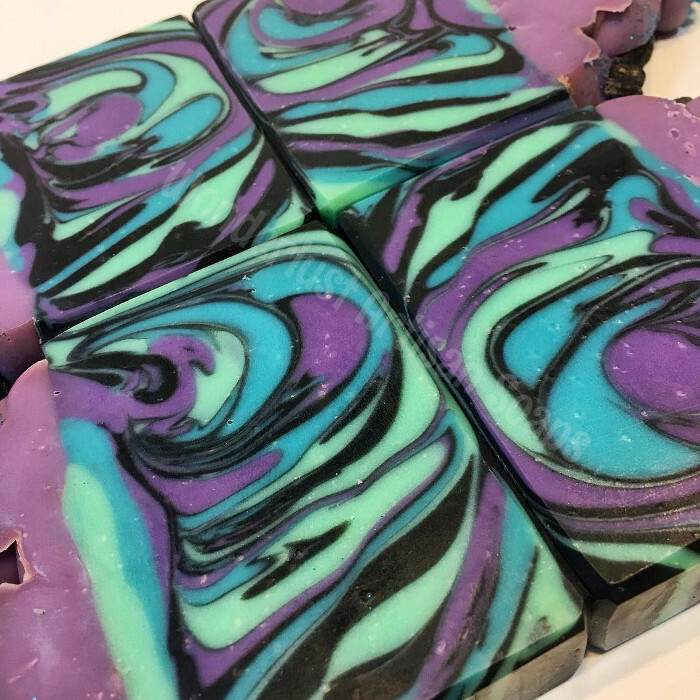 I feel like that’s my signature design and I love seeing the looks of awe and joy when people see that soap for the first time. Being able to brighten someone’s day is a such a wonderful feeling! Yes… Speaking of patience, I recently had a batch of soap accelerate really badly on me. I was in a hurry, making a new scent and design, and I ended up soaping at too high temps. 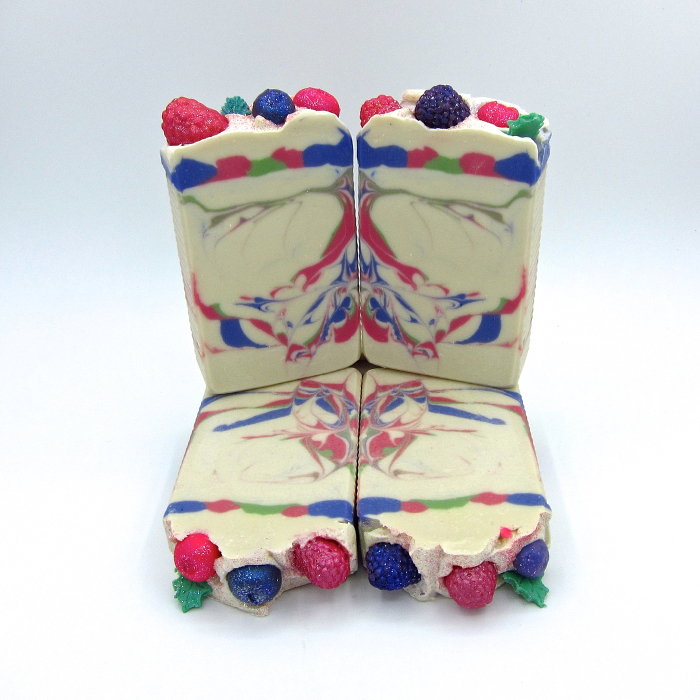 When I went to pour the swirl, the batter thickened up so fast, I nearly had soap on a stick! But, I kept calm and did a very fast design change. 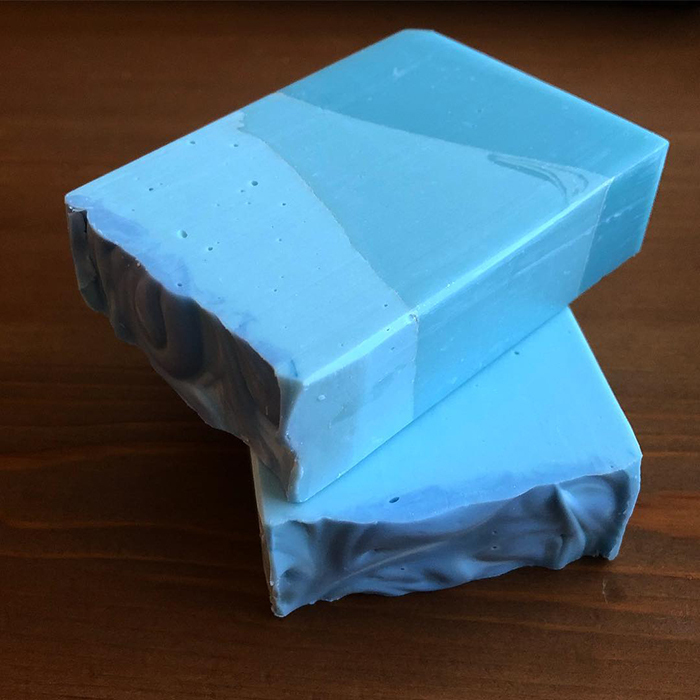 I was able to pour the soap into two layers with a clay line in between them. That night, I kept worrying that the soap would be a failure and I wouldn’t be able to use it. The next day, when I went to cut it, I was pleasantly surprised and ended up loving the new design. It turned out to be a happy accident! 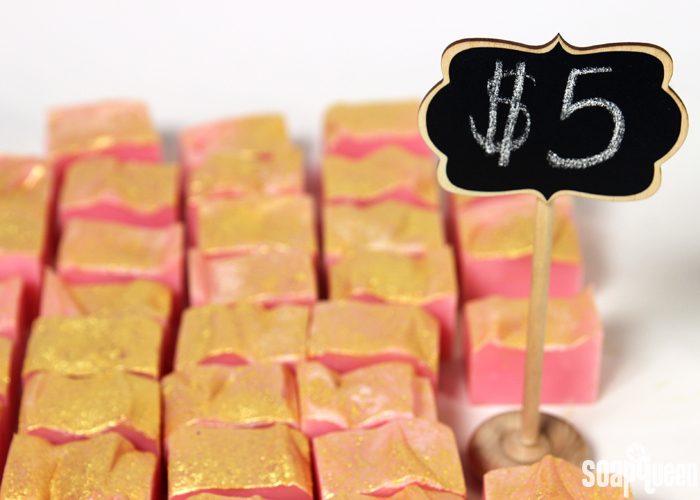 In fact, that soap ended up being the first one to sell out at a recent event! I learned my lesson (again) about patience, but also learned not to give up and to be open to new ideas and designs. 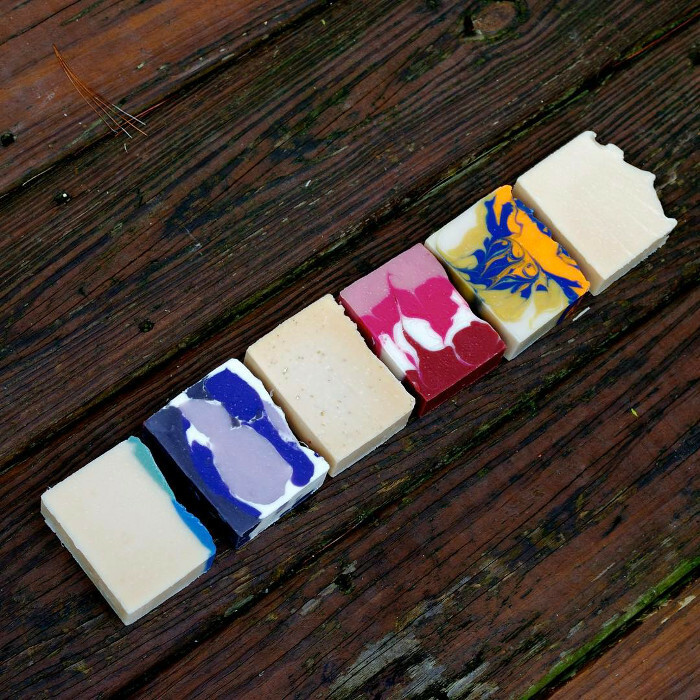 I love the entire process of making soap, but I especially love that soapmaking allows self-expression. It’s a wonderful art form to me, like painting, sculpting, or glass art. 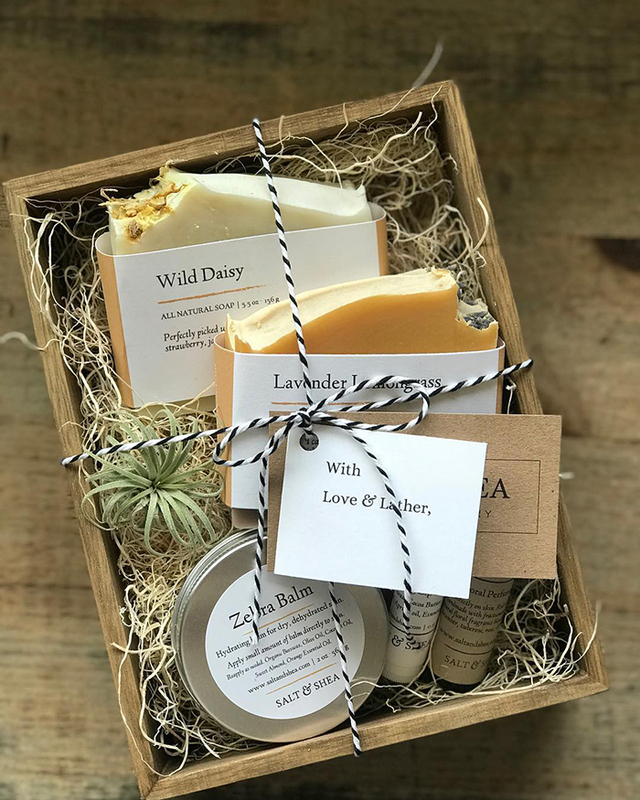 I love creating beautiful, natural products full of quality, organic, and natural ingredients to help people live healthier and happier lives. Most of all, I love being able to communicate with people all over the world and share my passion with them. My heart feels so full when I hear from people who have enjoyed using my soaps or who have been inspired by them. To me, that is the most fulfilling part of what I do! Ruth with PotterMade Soap started making cold process only 2 years ago. Since then, she’s mastered multiple techniques including layers and swirls. Customers and fellow makers love her intricate designs and beautiful photos. 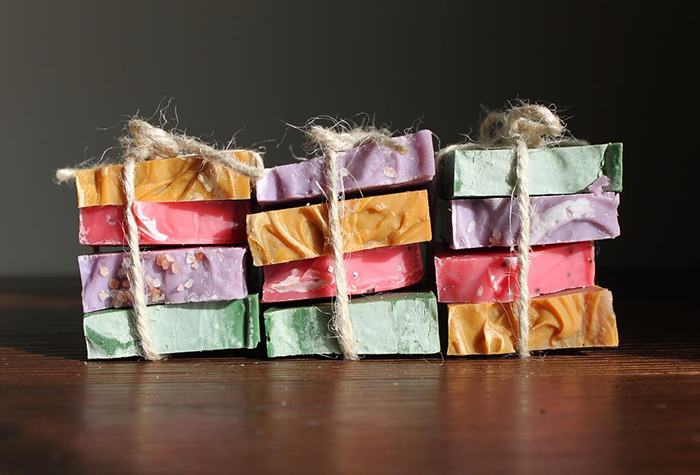 Learn more about how Ruth got started, what inspires her, and her soapmaking tips. I have been soaping for just over two years. 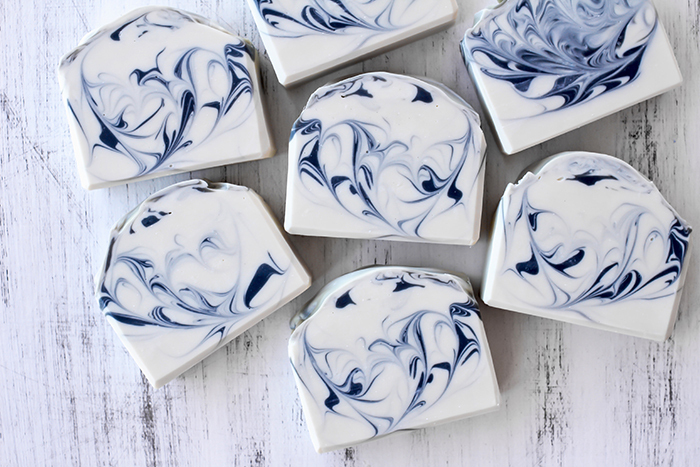 My mom, who is a china painter and quilter, turned her talents to making cold process soap. As she became more experienced, she not only offered to teach me, but also lent me the needed supplies. After my first solo batch, I was completely hooked! You know how they say that when you find your passion in life, the work is actually fun – that’s how soaping is for me! I quickly delved into learning the art by studying every tutorial on Soap Queen. 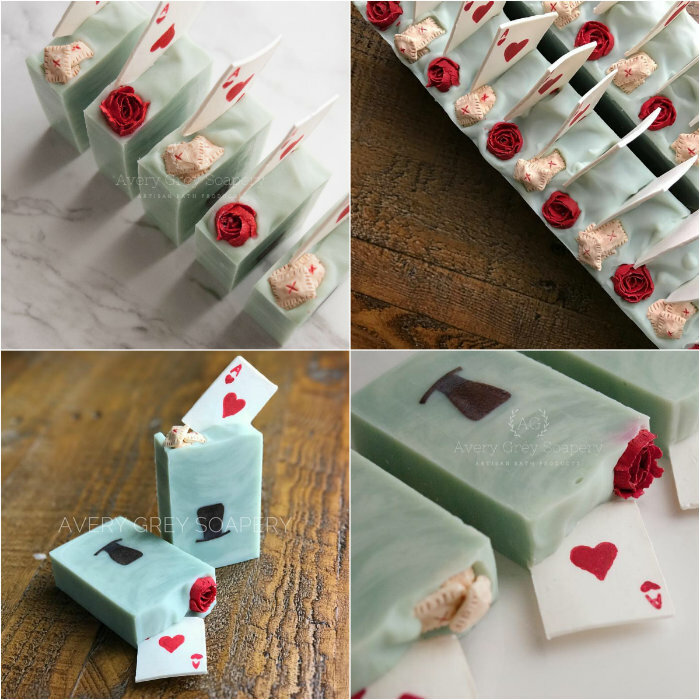 Afterwards, I wanted to explore more about the design aspect of soaping so I purchased Anne-Marie’s soaping books and experimented with new, elaborate creations. 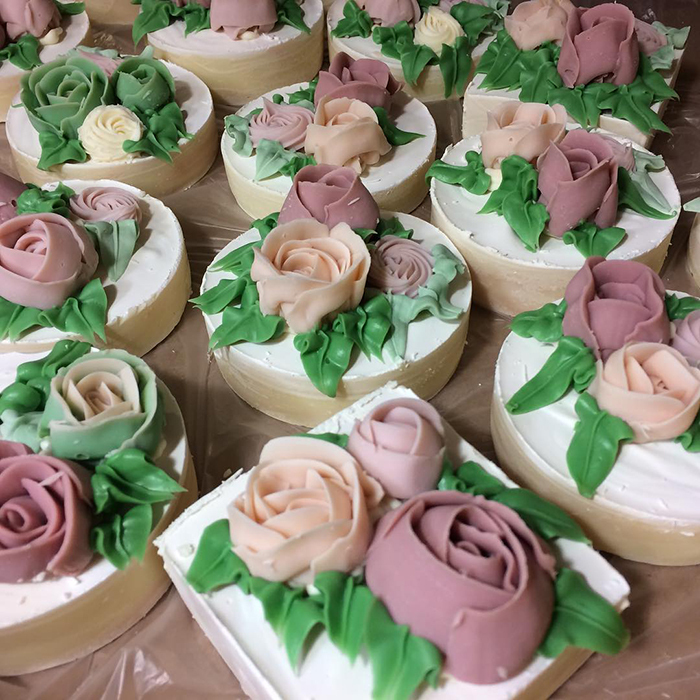 I was delighted with the way my soaps turned out! 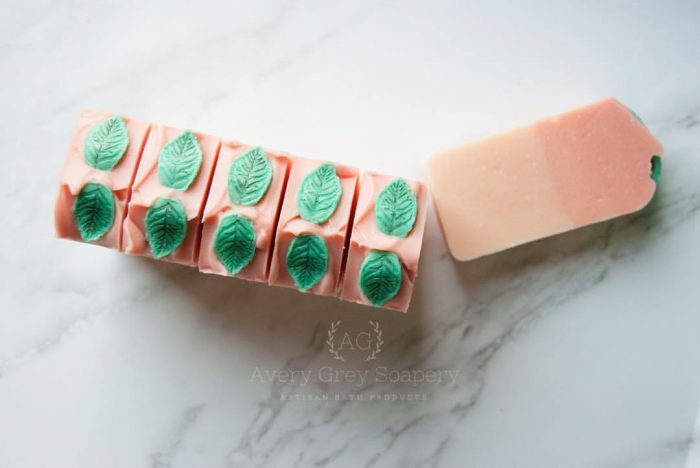 The Soap Queen video tutorials, informative articles, and blog could not have been more helpful in satisfying my desire to learn more and helping me gain the necessary skills. What advice would you give to those soapermakers just starting their businesses? Give yourself time to explore the technique and science of soaping. It is so important to get some good experience under your belt. 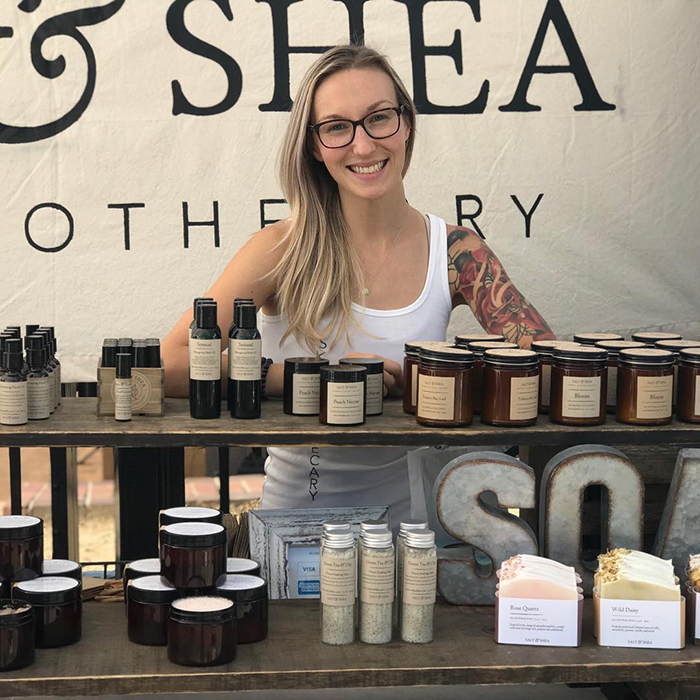 Soaping as a hobby and soaping as a business are two very different things. Educate yourself on the business aspect by understanding the laws and regulations in your area before diving in. Give yourself time to perfect your recipes. When you are ready, go for it and surround yourself with positive people who lift and encourage you! 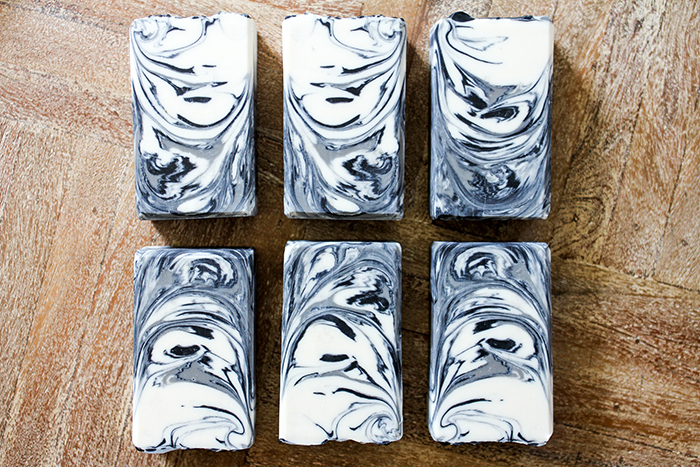 Cold process soap, hands down! 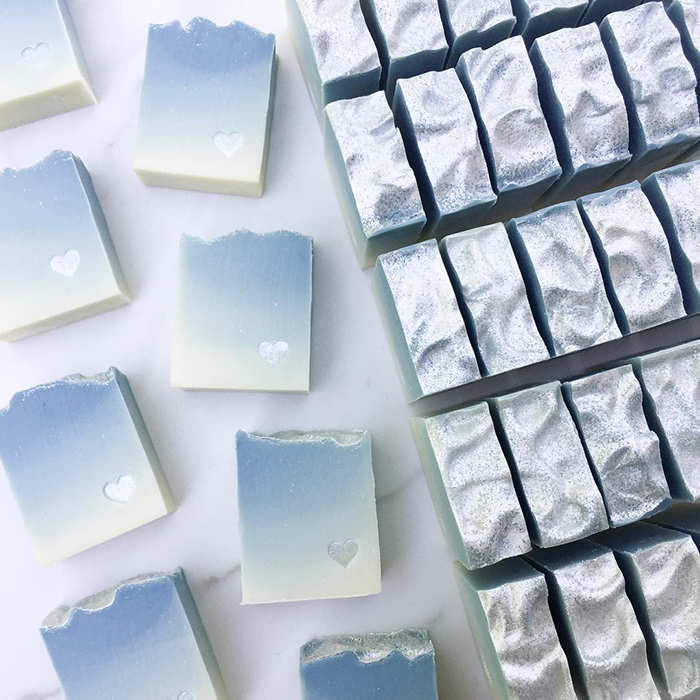 I love how cold process soap is 100% customizable from the choice of oils and butters used, to the color, design, and fragrances. I love the artistry of soaping. I truly believe soap is a consumable art form. Making soap is magical to me and truly my happy place. My family can walk in the door and tell I’ve made soap just by the smile on my face and, of course, how wonderful the house smells. My family and friends inspire me to create. I love creating a visual representation of a fragrance. It is very rewarding to create soap that becomes a simple pleasure and an added luxury in someone’s life. 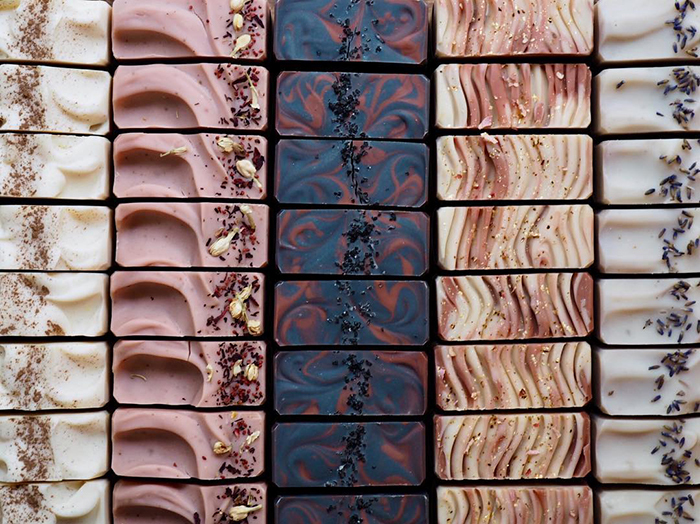 Soap makes such beautiful gifts. Everyone needs and uses soap! Choosing a name was really difficult! It felt like such a commitment! 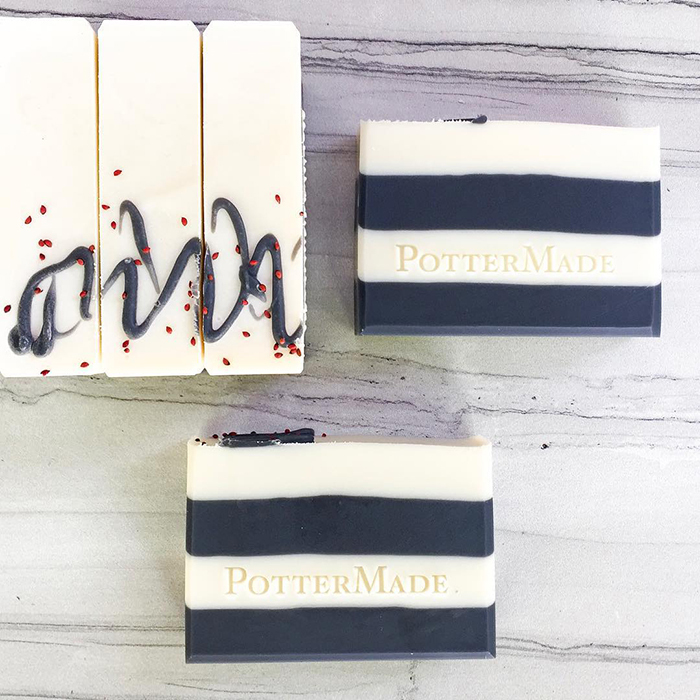 My last name is Potter, so I thought PotterMade, like homemade, would describe my products beautifully. I just completed my first half marathon! I had never run more than a few miles at a time and that was way back in high school. My husband inspired me to try after he trained and completed his first marathon a year ago. It was amazing to set a goal to do something I had never dreamt of attempting. I was filled with a huge sense of accomplishment and gratitude when I crossed that finish line. I can’t wait to see what comes next! Oh I have so many that I love! 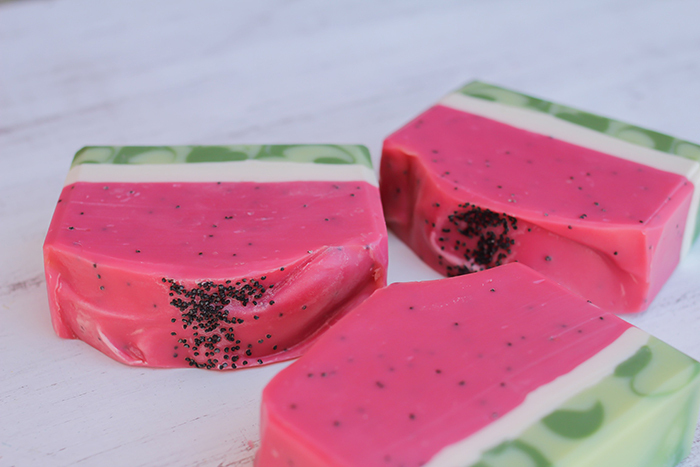 I love using Bramble Berry’s micas to create a range of vibrant colors in my soaps. Also, Bramble Berry’s activated charcoal is my favorite of any charcoal I have purchased. 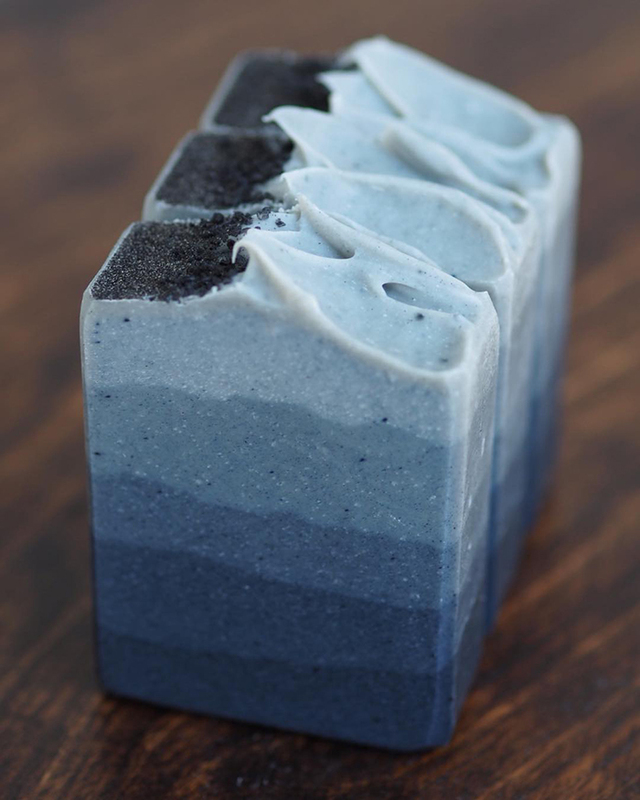 It creates a beautifully smooth charcoal bar of soap. Oh yes indeed! Last Christmas I was making soap to give as Christmas gifts to my friends and neighbors. I was attempting my biggest batch to date – 12 lbs. in one container. I didn’t realize that my stick blender could not reach to the bottom of the container. 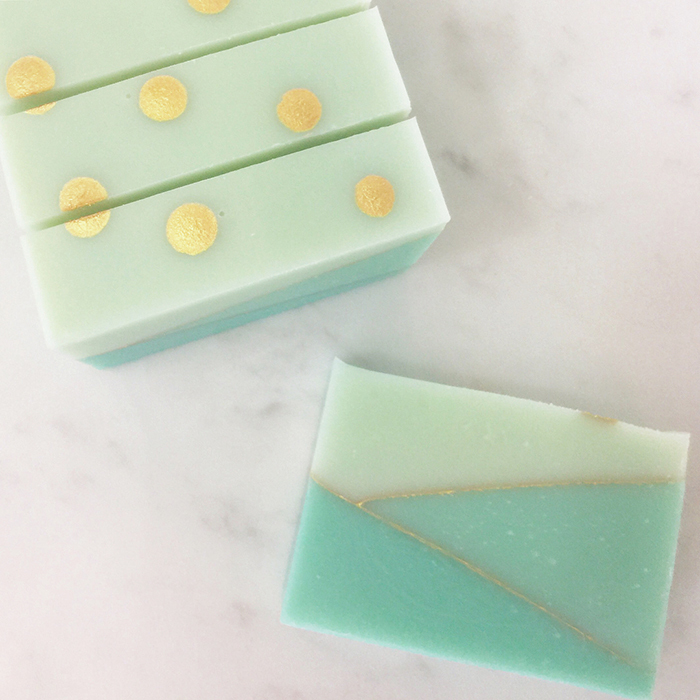 I poured these beautiful bars with intricate green swirls, with a gold-dusted textured top, that smelled of fresh Christmas trees. The tops were stunning and I couldn’t wait to cut it to see the swirls inside! I noticed the top had a wetness to it I was not used to, but hoped everything would fully soak in and saponify overnight. The next evening, with my first cut, I noticed tiny lye pockets oozing from the bars. I was devastated! The bars looked beautiful, but the only way to save them was to rebatch them. I may have stomped my foot and shed a little tear, but then I figuratively rolled up my sleeves, grated up each bar then and there, and rebatched them that night. 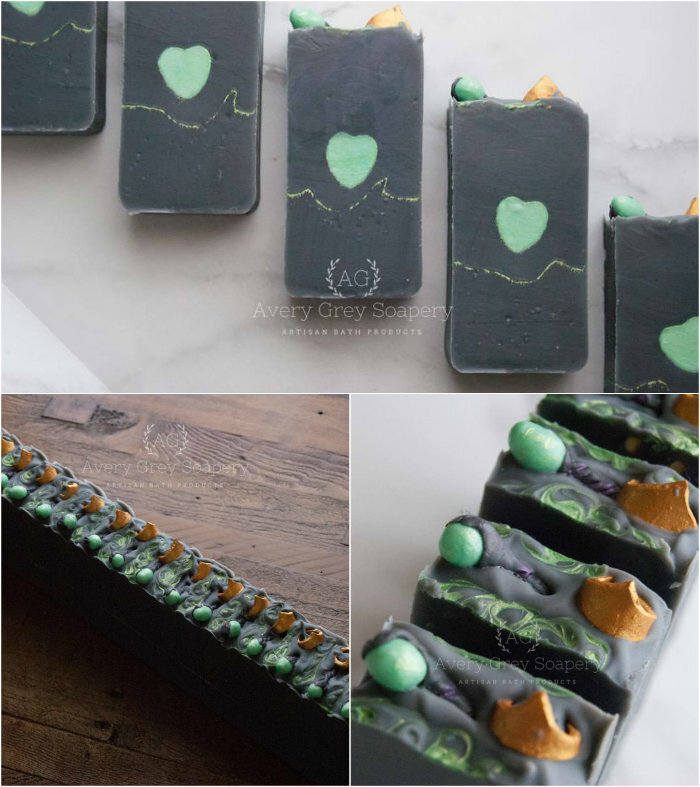 My beautifully-swirled bars were now very rustic green soaps with a rough textured top that resembled tree bark. Thankfully the rustic nature of the bars coordinated with their beautiful pine tree scent. Many people commented how they loved that the bars looked like wood and I never told them it was all because of a careless mistake. 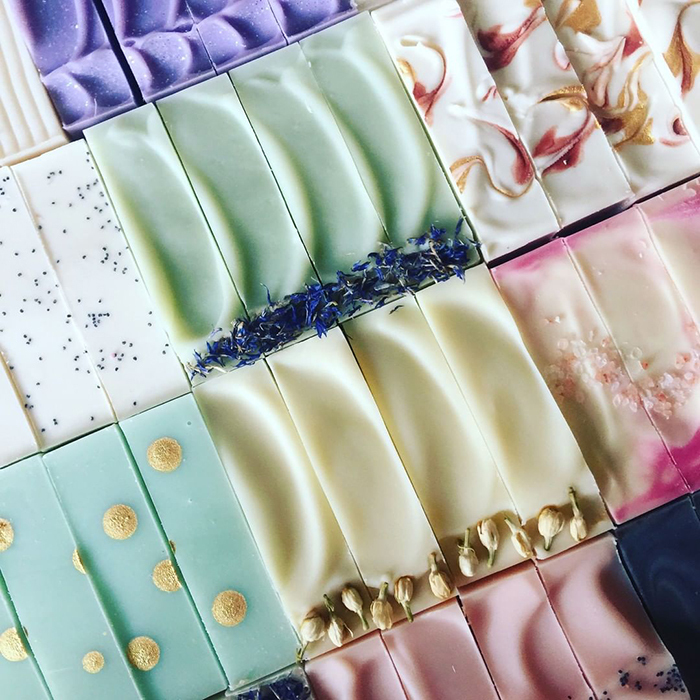 I learned how important it is to be able to roll with unexpected results and that even our mistakes can create beautiful soaps that can be enjoyed. I would give them one of my Honey & Oats bars. 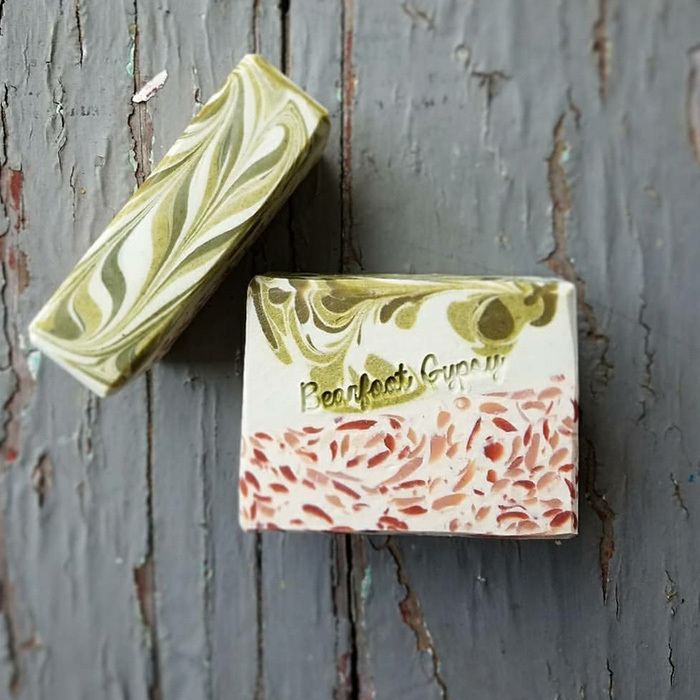 It is a very gentle bar of soap with a cheerful sweet scent everyone loves. 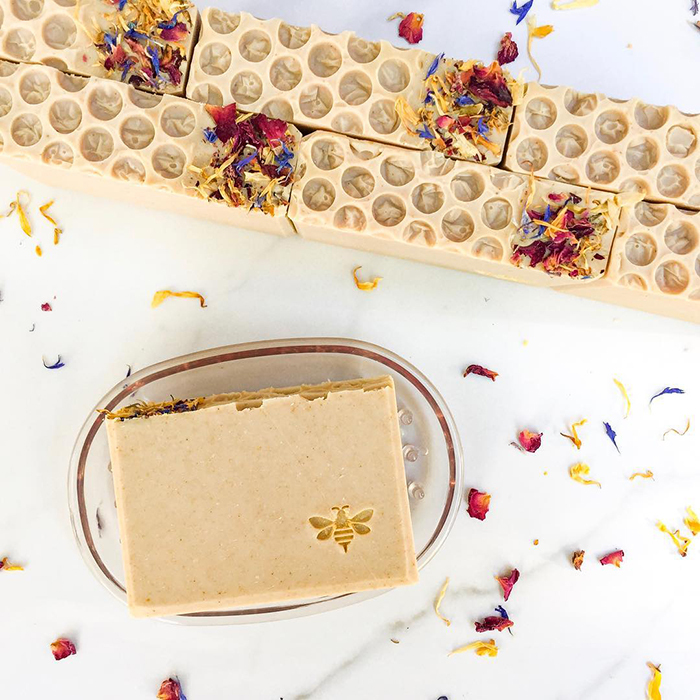 I stamp each bar with a dusted gold bee stamp and so many customers comment how much joy that little bee brings to them. I love creating products that not only benefit our skin, but also add a touch of happiness to everyday life. Respect the lye. Always wear protective gloves and eyewear. Oh – and clean up right after you finish making soap. I always breathe a sigh of contentment after washing that last bowl or spatula. It’s no surprise that providing good customer service is an important part of running a small business. This post has tips about how to interact with customers so they’ll keep coming back. As a small business owner, you wear a lot of hats. The thought of making time to answer questions on social media can be daunting. Kellie with Old Field Farm definitely understands – on top of selling her soap, she also works full time. She said there are a lot of talented makers out there, so it’s important to stand out with fast and friendly customer service. 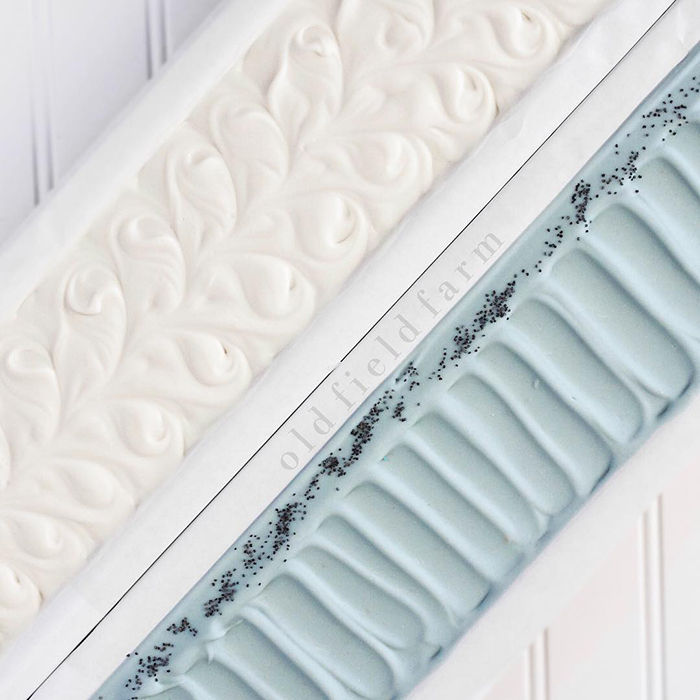 Beautiful soaps by Old Field Farm. Reputation is another aspect to consider. Many small business owners can’t afford advertising, so word of mouth is very important. Sarah with Spicy Pinecone said you need to be consistent, fair, and efficient with every customer. 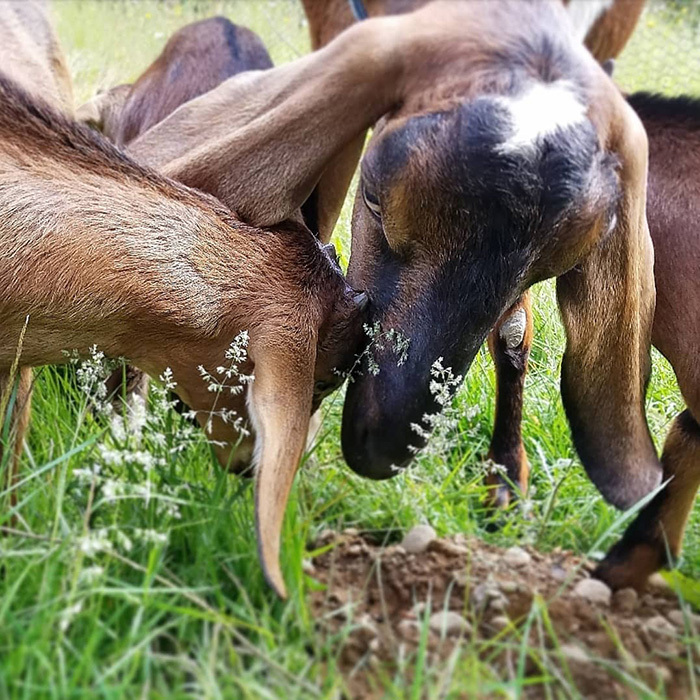 There are a lot of things to remember when preparing for a farmers market. Even with the best planning, there are items you may not think to bring. We reached out to makers on Instagram to find out what they recommend. Find their tips below. The biggest help when I’m getting ready for a market is using Microsoft Excel (so boring, I know). I make numerous spreadsheets that organize the hundreds of thoughts swarming around in my head. It’s easier to plan for and then execute your ordering, production, setup, etc. when all of the details are visually laid out in front of you. The biggest thing to tackle (in my opinion) when getting ready for a market is the product quantity. You need to figure out how many products you’re going to bring, what materials you need for each product, and then how much of each material you’ll need to make that quantity of product. You can create a spreadsheet that will help you determine those amounts, plus any others. So don’t do math! Let Excel do it for you. Then you can focus more of your time on your business! 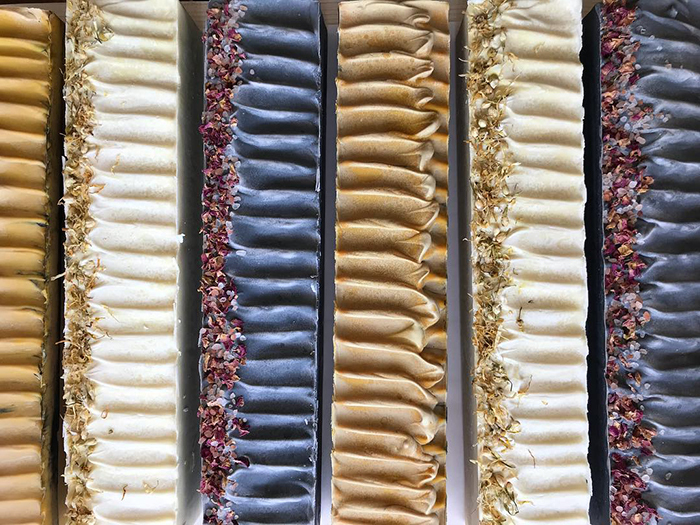 Soaps & Sunflowers’ beautiful collection of gemstone soaps. One essential item that I think people don’t think about bringing to markets is a floor mat. Customer service is extremely important when you are selling your products, which means you need to be standing and engaging with people who approach your booth. The problem with that is it can be tiring on your back. So a nice long floor mat where you walk frequently helps more than anything! Personally, we use a thick yoga mat. It’s long, cushioned and very portable! Another thing I cannot do a market without is my credit card reader – 70% of sales come from credit cards. My biggest sales 90% of the time come from people asking if I take cards because they want to be able to spend a lot. A must-have! Bring a well thought out setup, including a gorgeous sign and a few props. If your setup is organized and has a cohesive theme, it is more likely to attract more buyers. Tip: do a mock setup before you attend the event and take a picture – this significantly reduces the set-up time. An item you may not think to bring is a power bank! If you are attending a fair that is being held outdoors, or you happen to be assigned a space that is in the middle of a room without access to a power outlet, you can find yourself in a predicament where you aren’t able to use your devices to accept payments. I learned the hard way my first event, and now I have two fully-charged power banks with me at every event. A tip for new sellers – it is imperative to do some research on the market(s) you are attending. I’ve been to only a few selective fairs, as I needed to make sure that my investment (the vendor fee) is something that I can recoup. And how did I do that? I read tons of reviews. 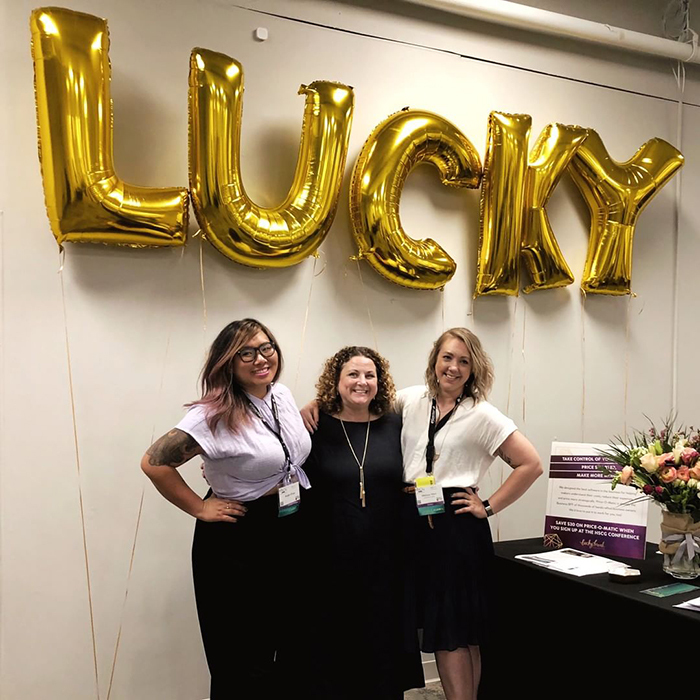 You will be pleasantly surprised at the amount of information that is out there, especially if you are looking to attend an already established fair. 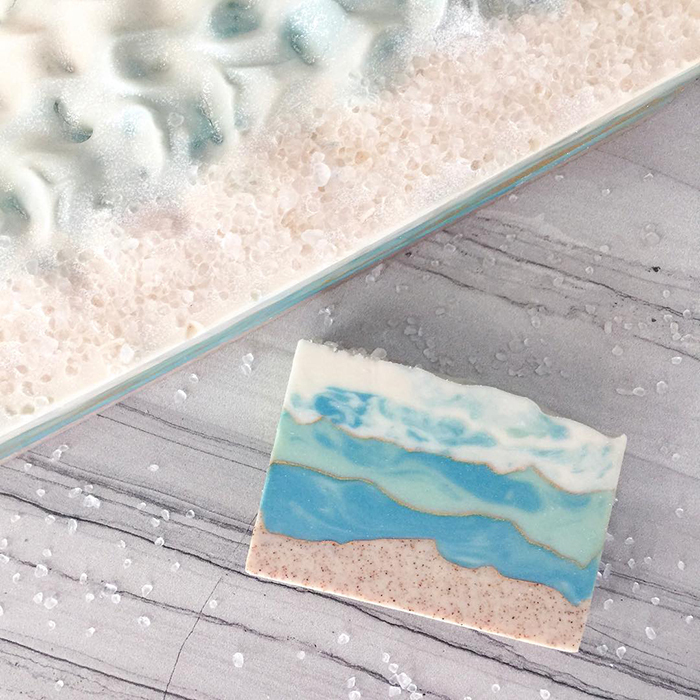 Stunning soap tops by Milked Artisan Soaps. 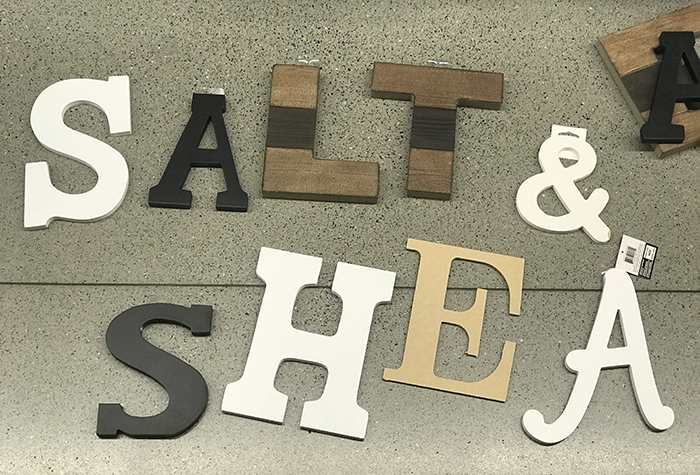 When we are preparing for markets we like to make sure we have a nice, clean, eye-catching setup with a nice variety of products. One thing that we like to make sure we always have plenty of is samples! Giving small samples of creams and soaps is always a big hit with customers! We like to label the samples with our name and product info to make it easy for customers to find us again. Most importantly, even if it rains, our tent blows over and we forgot our samples, we try to always have a great day and meet a lot of awesome people. 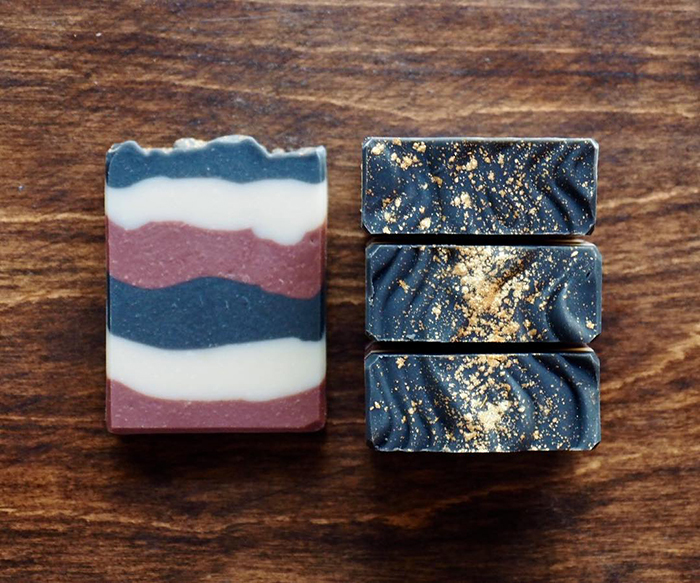 Anna-Kate, Ole Tradition Soap Co. When packing for markets, I always make sure to bring plenty of business cards! Even if someone doesn’t buy something right away, they’ll take your business card and find your online store later. Just make sure you have plenty of information about where to find you! Your cards don’t have to be anything fancy – just your company’s name, logo, and where you can be found online. I print mine right at home to keep costs low. 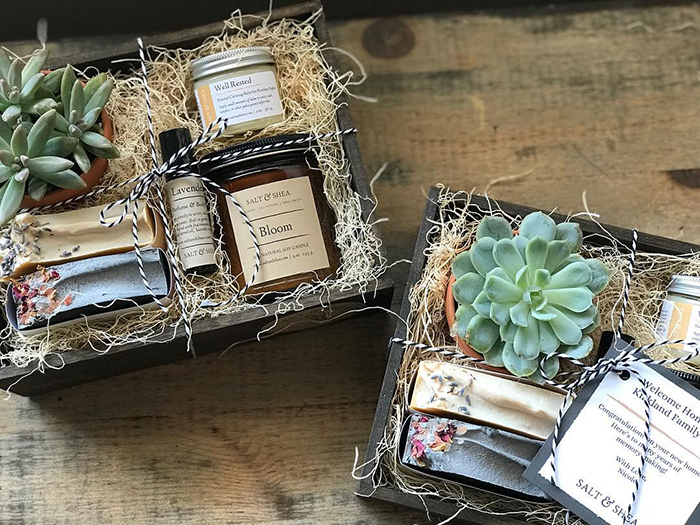 Ole Tradition Soap Co.’s sample packs. Pay attention to the direction of the sun. If you have products that melt you want to make sure they aren’t in direct sunlight. Typically the set-up time at a farmers market is before the sun is fully up. Once the sun is up you are busy with customers. If you think about this early on then you won’t have to rearrange your booth mid show if you have products that are light and heat sensitive. Make sure you get a tent that is easy to assemble. Don’t mess around with separate poles. You want a tent that can hold its own in the wind and not crumple under water weight. Speaking of weight – get some heavy weights so your tent doesn’t blow away. Yes, it will storm at a market – it happens to everyone. Get a can of water repellent spray and put a good couple of coats on the fabric. Make sure to put plenty along the seams and touch points where the canopy meets the frame. For a sunny day it is nice to have walls up on your tent but it can get pretty hot in there without ventilation. You can pick up some pretty inexpensive sheer curtains from the home store that will provide some shade and still let the breeze through. You will want some side walls for those rainy markets though. You will want to get something easy to whip up if there is a sudden rain storm. I got some pretty economical side walls off of Amazon that had Velcro straps for easy and quick set up. I recommend you get a hand cart and totes. The hand cart is a back saver and the totes will provide a sturdy, waterproof place to pack your product. You want bins that are the same size so stacking on the cart is easy. It is tempting to save some money and use cardboard boxes or canvas bags, but they can get wet and your product could get damaged and they aren’t as easy to transport on a cart. My top tip for using your cart is to make sure you strap your product down! I have experienced packing all of my totes on the cart and wheeling that cart down the sidewalk where I, inevitably, hit a crack in the sidewalk that I wasn’t prepared for and all my stuff flies off the cart! It didn’t just happen to me. I have seen this too many times to count. I went to the hardware store and got some cinch straps to tie down my totes and I haven’t spilled a cart of my product since! Height is nice for your display. 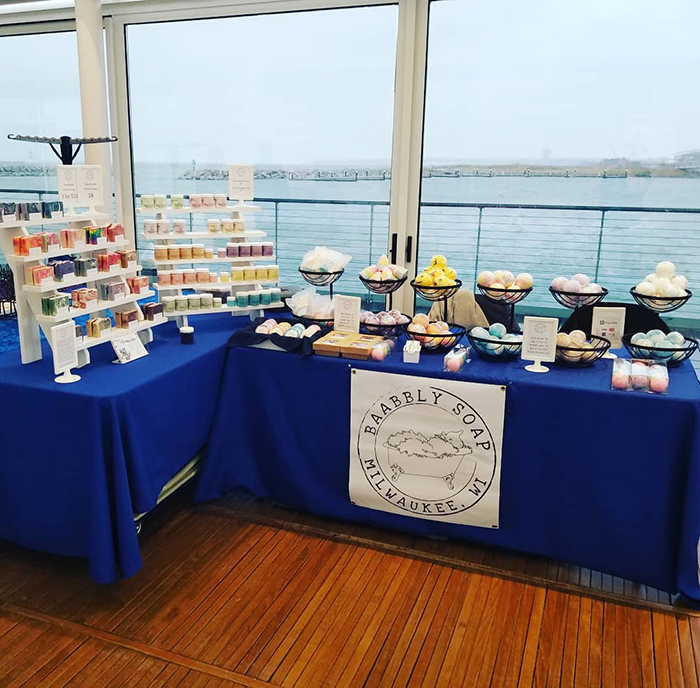 I use two-tiered fruit stands that I got from TJ Maxx for my bath bombs and a nice tiered shelf for my soaps and scrubs that we made from wood at home. Having product closer to eye level is a bonus for your customers. They will be able to see the product and read the labels without having to pick everything up. Think about where you will be vending when planning your shoes for the day. One of my first markets was on grass and I didn’t think about how dewy the grass was going to be until I was traipsing around on it and felt how wet my socks were. Sandals are nice because your feet will dry out, but standing all day can be hard without support. I invested in some nice waterproof shoes that were made for hiking. They kept my feet dry and had a decent amount of cushion that was great for standing for hours. 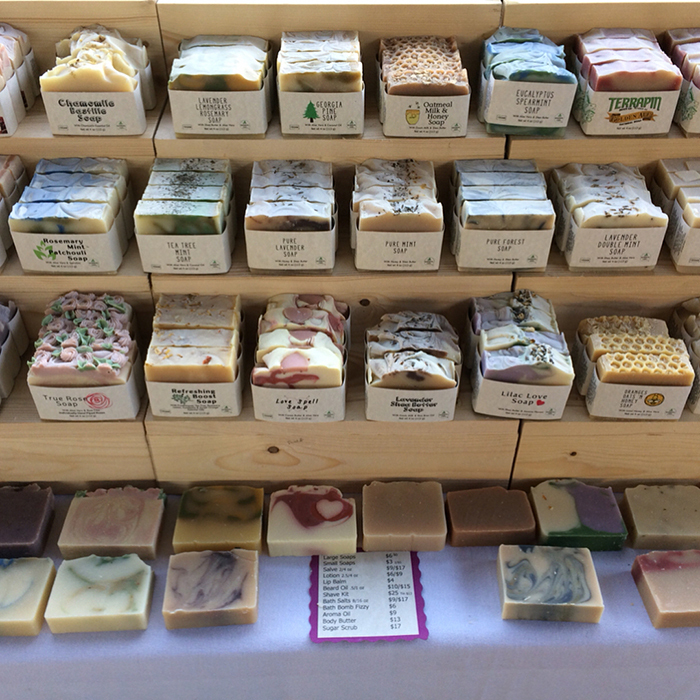 Baabbly Soaps’ lovely market display. I think one important thing to take to a show that you might not think about is a cell phone power bank. You might not have anywhere to plug in a regular charger, and all those credit card sales will drain your phone! I also recommend being prepared for wind if it’s an outdoor show. I learned this lesson the hard way when all of my signs started blowing away at one show I did. Don’t forget water! I always get so dehydrated at shows from talking so much, and not all shows have available water. My last tip is to enjoy! It really is fun to sell products that you made! Count inventory that you’re bringing and create a spreadsheet with quantities of each item. When someone buys something, make a tally next to that item on your sheet. A clipboard and pencil hidden behind your table works great for this. This helps you to know in the moment what you’ve got left, and you can reconcile that at the end of the day to make sure nothing went missing. Create a checklist for essential items and physically mark off the items as you load them into your car. You don’t want to drive halfway to the farmers market 30 miles away at 5 a.m. and realize you don’t have your Square reader. Ask me how I know! Bring a helper; someone who can speak a bit about your product, if possible. If you need a potty break, you need the helper to watch your booth. Also, the helper can handle cash and give change while you talk up the customer, thank them for their purchase and package their items. Bring water and snacks (and sunscreen). A lot of water! You’re going to be chatting all day long and your throat will get dry. If the people turn out, you won’t have time to walk away and grab lunch, so snacks are never a bad idea. Put some effort into your setup. Get a sign made, or make one if you’re crafty. Practice your setup at home before the market. Also, make sure your items don’t look over-handled, dirty or otherwise dingy. This can be challenging if you load and unload a lot, so work that into your packaging if you’re planning on doing a lot of markets. 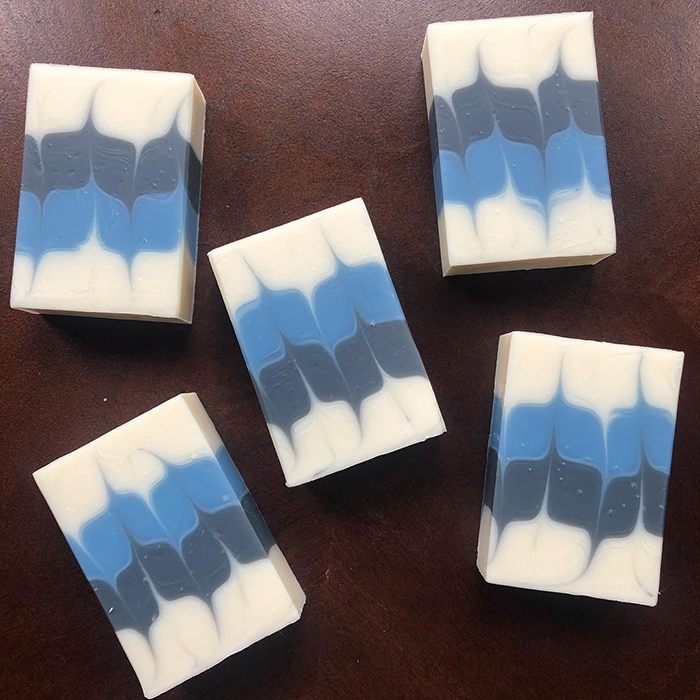 Glacier soap by Affinity Soapery. Keeping up with trends used to mean switching on your TV or picking up a magazine in the checkout line. Now the most popular colors and designs are right at your fingertips. All you have to do is scroll through Instagram or Pinterest. That makes it easy to try new things and keep your products fresh. Learn how to incorporate trends into your designs below. Inspiration is everywhere you look. Instagram is a great place to start. 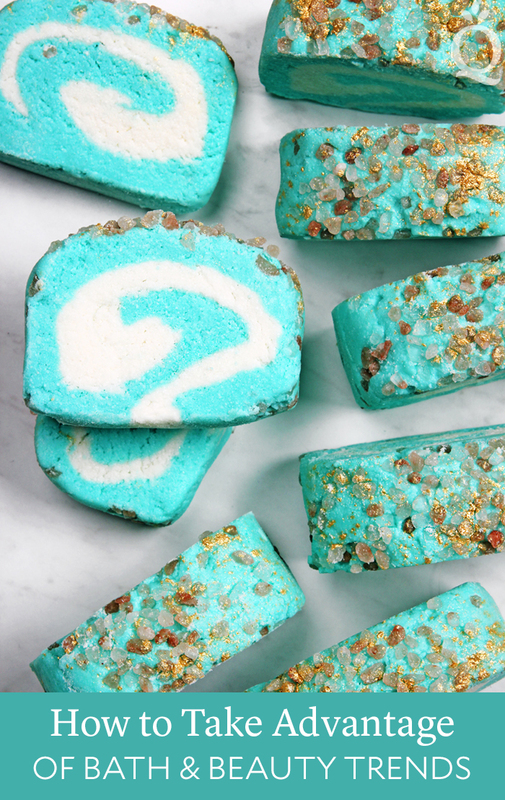 Fellow soapmakers can help you brainstorm – the #BrambleOn tag is full of amazing designs. Seeing all the photos in one place can help you identify what people are loving at the moment. You can also search tags like #soapshare and #soapmaking, then follow your favorite makers from there. Pinterest works in a similar way because you can follow pages that share things you’re interested in. You can also search a subject and see every DIY project under the sun. Yvonne with The Snoblove Bar uses Pinterest for inspiration. These are her Geode Blossom Bars. Other options include blogs, YouTube, magazines like Willow and Sage, and the Soap Challenge Club. Don’t feel limited to just soap pages. Yvonne follows Pantone and interior design pages for ideas. She also loves seeing all the colors and textures in fashion shows. 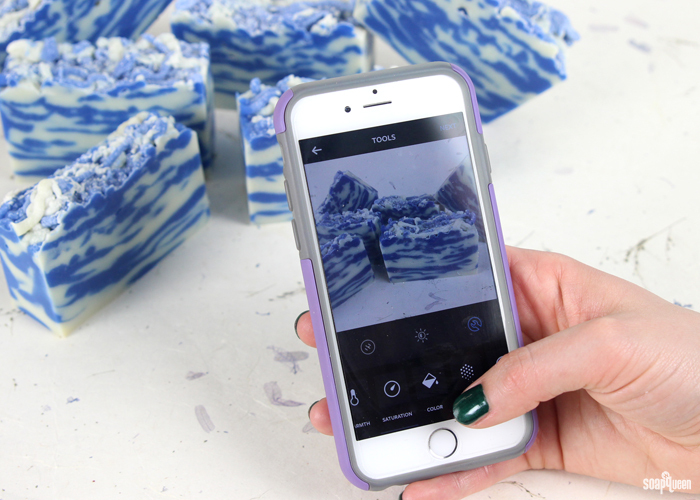 Tania with Soapish follows people who make paper art, stationary, and pottery. She visits local stores and galleries to see their newest inventory. As a cake decorator, she also finds plenty of inspiration from baking techniques. For instance, you can create shapes for cookies and cakes using fondant. 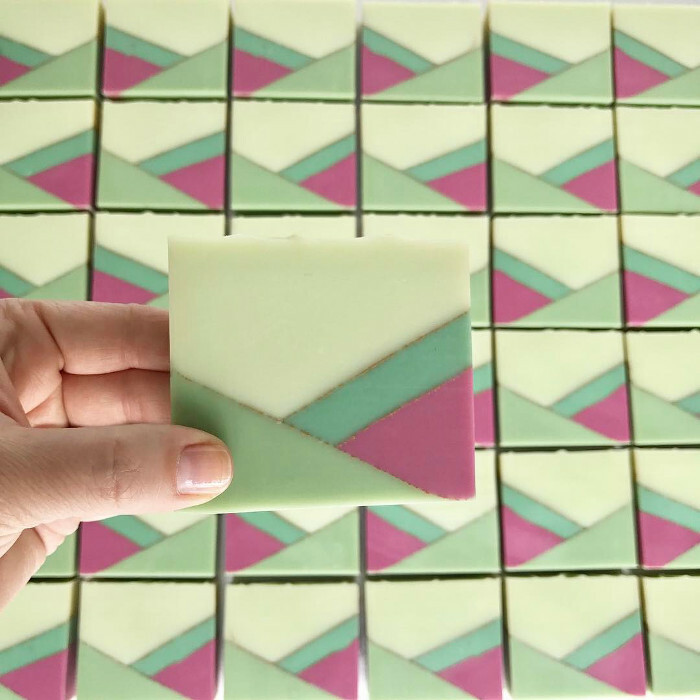 You can use a similar technique with soap dough. 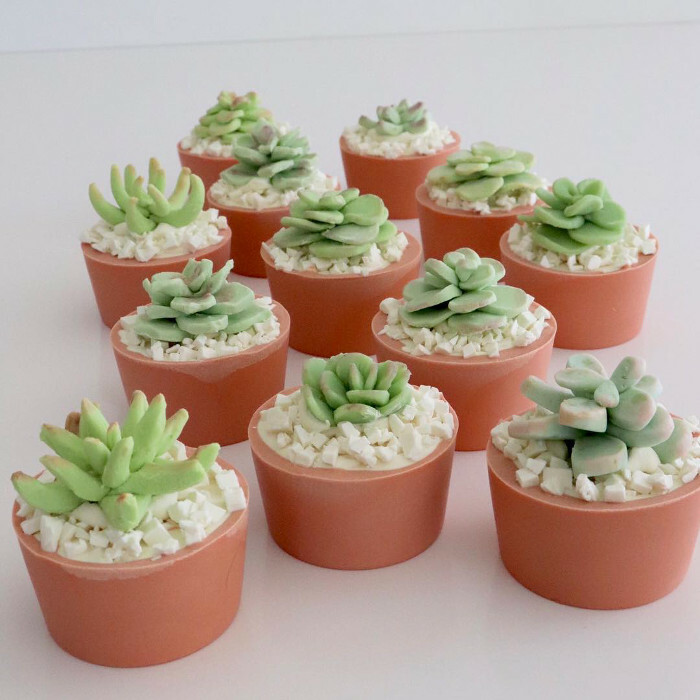 Tania with Soapish created these adorable succulents using soap dough. Some of our favorite bakers include SweetAmbs, who creates intricate cookie designs using a variety of tools. Lottie & Belle creates over-the-top cakes with piping and embellishments. Once you find a trend that speaks to you, it’s time to work it into your project. 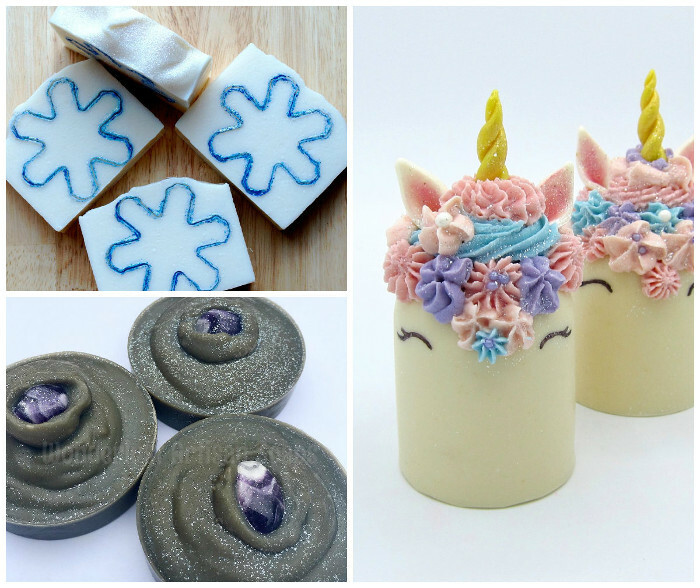 Lisa with Small Batch Soaps takes a trend like unicorns and breaks it down into key elements. That includes a horn, ears, eyes, rainbows, and glitter. She identifies which of those she’s interested in and then draws her design out on paper. If she hasn’t tried the technique before, she heads to YouTube or other blogs for advice on how to get started. Then, she makes a small batch to see how the idea translates to soap. 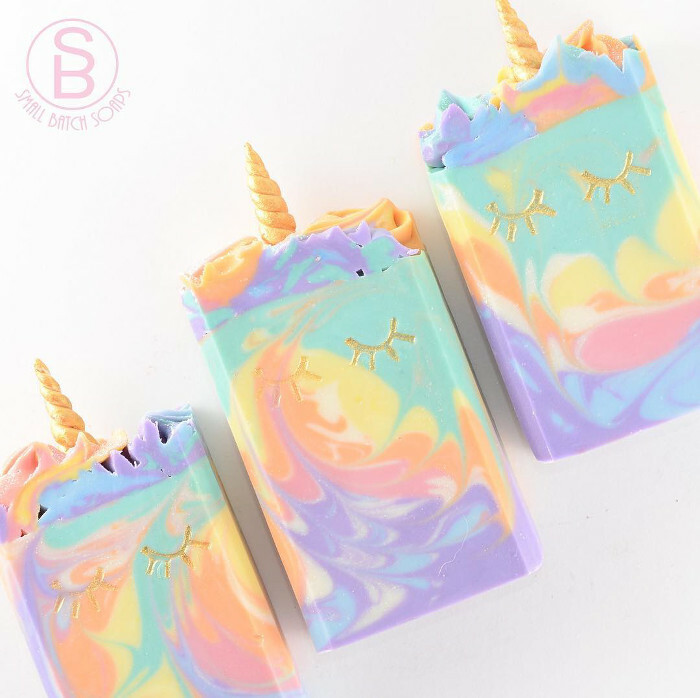 Lisa with Small Batch Soaps makes several variations of these stunning unicorn bars. Yvonne with The Snoblove Bar likes to approach trends a few different ways. The first is a more literal interpretation. For instance, she noticed people are loving flamingos right now. Options for working with that trend include a flamingo embed in the middle or on top of your bars. You can also create bright pink bars and then cut out flamingo shapes using a cookie cutter or sharp knife. With the Daisy Cold Process Soap, we went with this method. 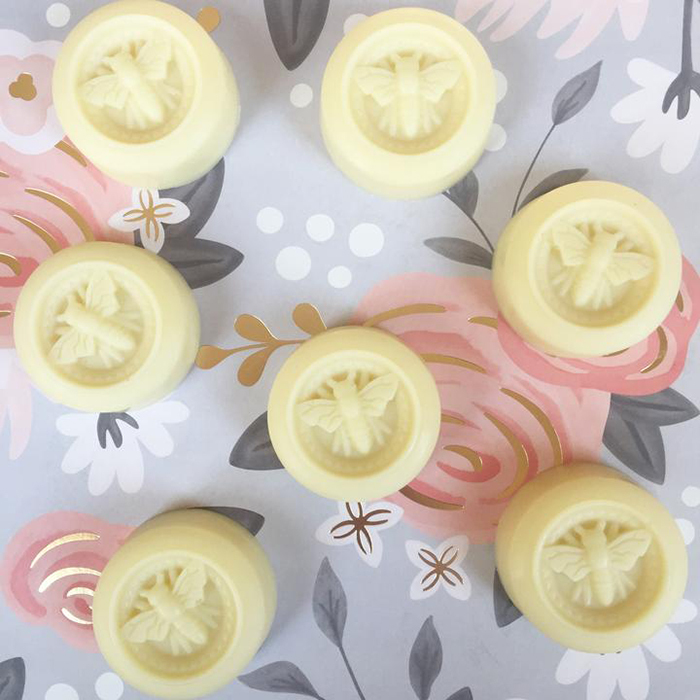 The embeds are made with the Mini Daisy Silicone Column Mold and the soap features a classic yellow and white color palette. The other option is a more abstract interpretation. Yvonne sometimes goes more literal with her designs, like the beautiful piped flowers on the Pretty Peach Bar. You can play with elements of the trend rather than making it the main theme. 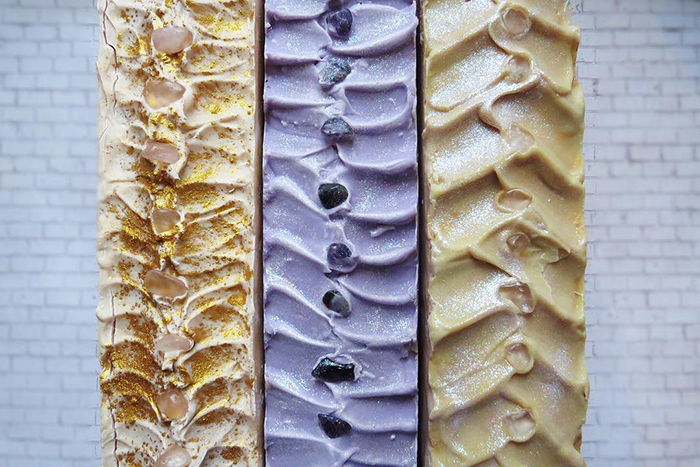 In place of embeds, the Swirled Orchid Cold Process Soap features a purple and white swirl design topped with jasmine flowers. It’s scented with Blushing Orchid Fragrance Oil. It can be tempting to incorporate every trend you love into your designs. However, it’s important to ensure they still look like your products. You want people to recognize your creations and come back for more. Yvonne kept seeing soaps inspired by Minions. She thought the bars were adorable, but she couldn’t find a way to work the theme into her line. Her brand is feminine and light. She works with pastel colors, piped flowers, and elegant embeds. Tania with Soapish agrees. Her creations contain a lot of shapes, angles, lines, and layers. If she can find a way to work with a trend using those design elements, she’ll give it a try. If not, she’ll try something else. Tania loves working with angles and layers.